Watch out. This is a very long, but neither less a very interesting impression of the FlightFactor aero and QPAC Airbus A350-900 Series. It covers the current model, as of this writing on December 2016, which is version 1.3.1. 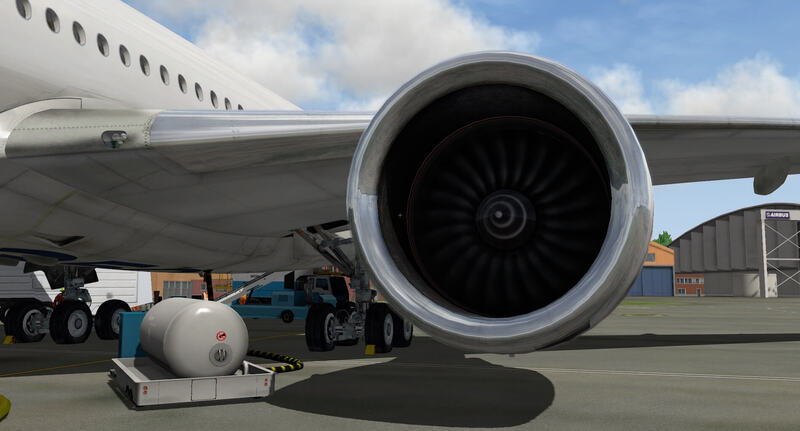 Another update will follow soon which will be as far as I understood from FlightFactor, compatible with X-Plane 11pb “x” version and with, of course, later official released X-Plane 11 packages. FlightFactor aero that comes with an Airbus? Yes, you’re right …. 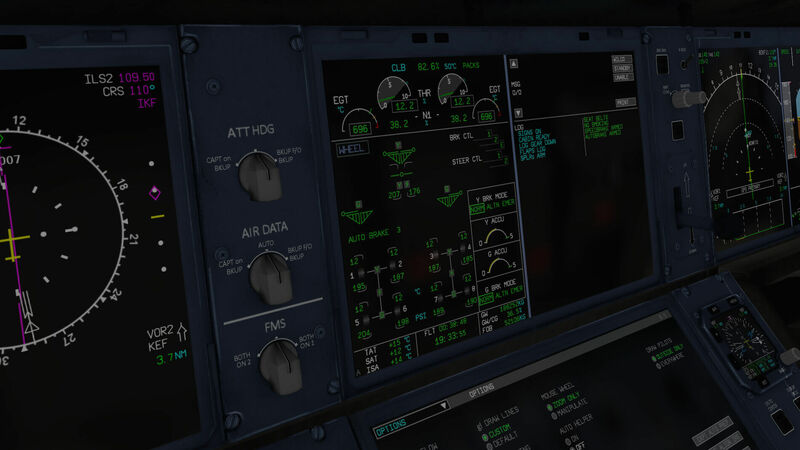 since Aerosoft Sim News is no longer alive, I decided to use this review for X-Plained, but rechecked its contents, updated text whoever applicable and made new fresh screenshots. Anyway, till now FlightFactor produced the Boeing 777, 757 and the 767 besides other Russian models. 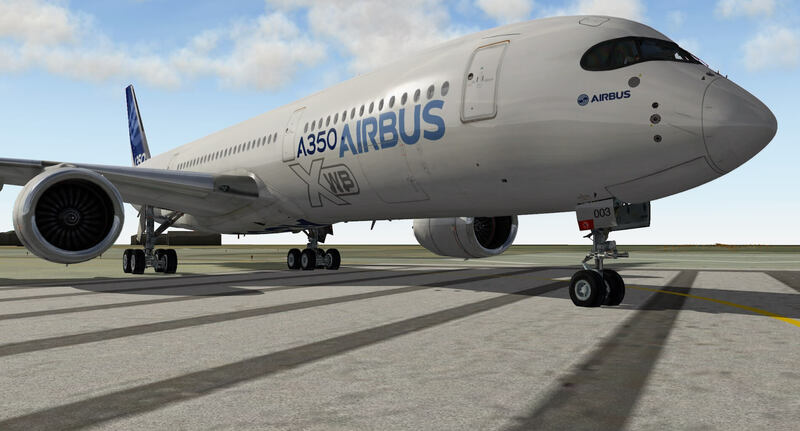 All are X-Plane models with high standards, but the sudden chance to fly an Airbus A350 is something special. It is also special because at the time of this writing (so this was then), October 2014, the A350 may fly already, but there are still no airlines that operate it. Those A350 aircraft flying around are only aircraft from Airbus itself. But with the redux of this comprehensive review, rewritten / rechecked on December 2016, a refreshing A350 aircraft comes out of the sky! Nevertheless, the Airbus A350 is different from a Boeing 787 and every Airbus has also a different philosophy than Boeing aircraft. How an aircraft flies, that’s not really different; how the autopilot, autothrottle or autoflight works is basically the same, but the philosophy of how to implement it does differ. 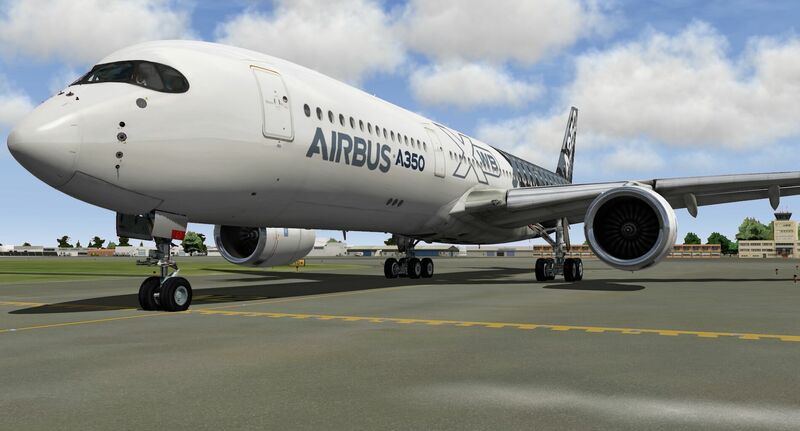 The modeled FlightFactor aero A350 is actually an Airbus A350-900 Series and according to Flight Factor lead developer Roman aka Ramzzess, this first A350 package will cover the A350 XWB Advanced version. 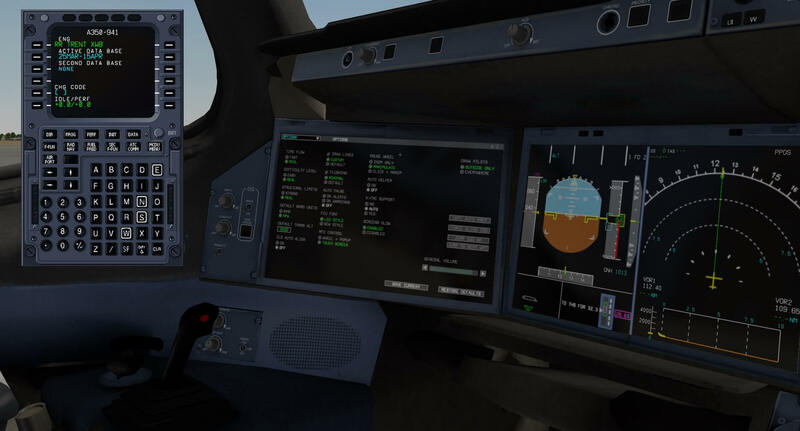 According to Flight Factor the Advanced version is “a new product line which we offer X-Plane users to give you the opportunity to experience the full range of capabilities of the real plane without the need to invest too much time into learning the systems. – Fully custom aircraft systems. – Fully custom ECAM monitoring system. – Fully functional Airbus style alert system. 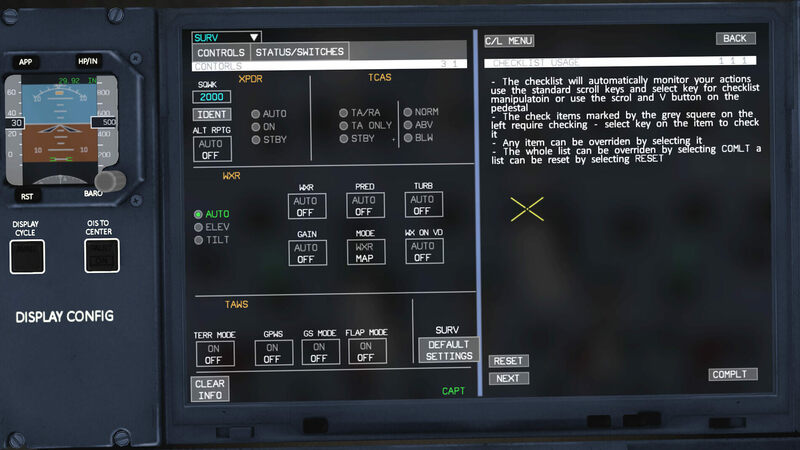 – Fully functional interactive Airbus electronic checklist system. 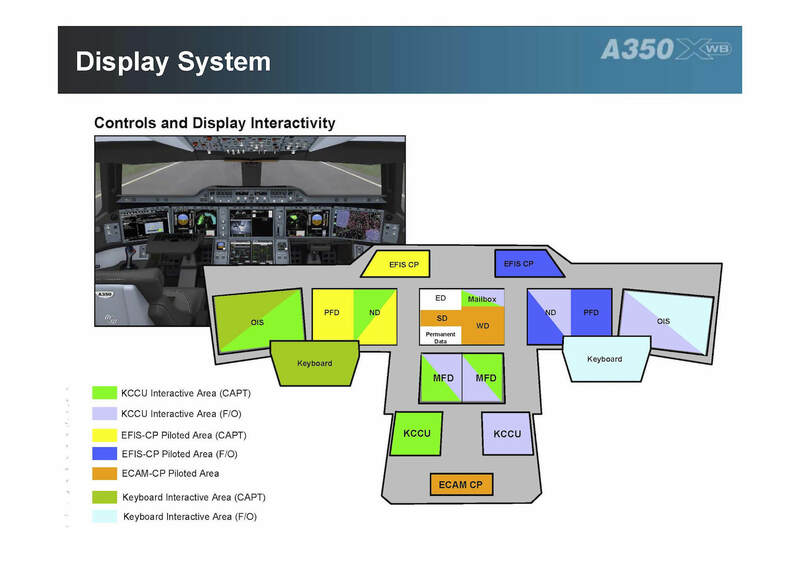 – Airbus A350/A380 unique “touch screen” interfaces. – Fully custom and unique MFD (Multi Functional Display) system. 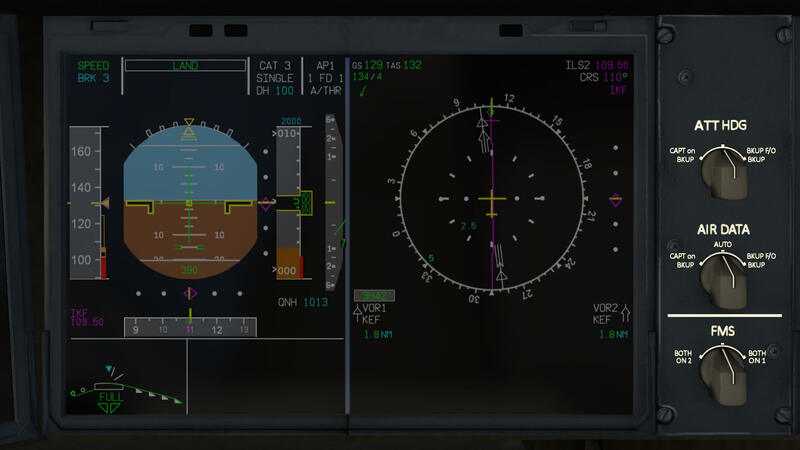 – Full OIS screen system with many aircraft options. – Old style MCDU and fully functional AUX instruments as backup. – Advanced flight planning interface based on X-Plane native data. 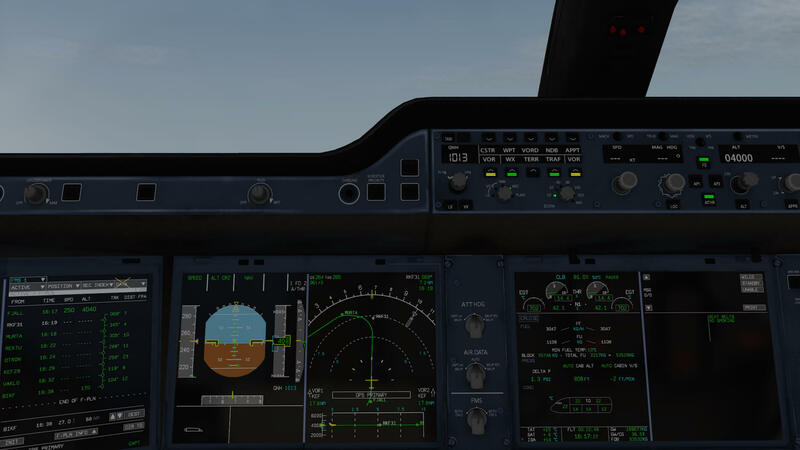 – Basic SID/STAR implementation using X-Plane FMS-files. – “What you see is what you fly” flight path indication on the ND. – Implementation of most of the Airbus AP modes. – Full PFD and ND displays. – Independent Auto Pilot systems. – Scroll mouse wheel support for switch manipulation. – Added internal glow effects. – Added flap load relief function when you exceed VFE. – Added TO performance calculator to both OIS and backup MCDU. – Added XFMC support options. – Adapted stall-, max-, and other characteristic speeds in accordance with real data. – and much more features since its official release. 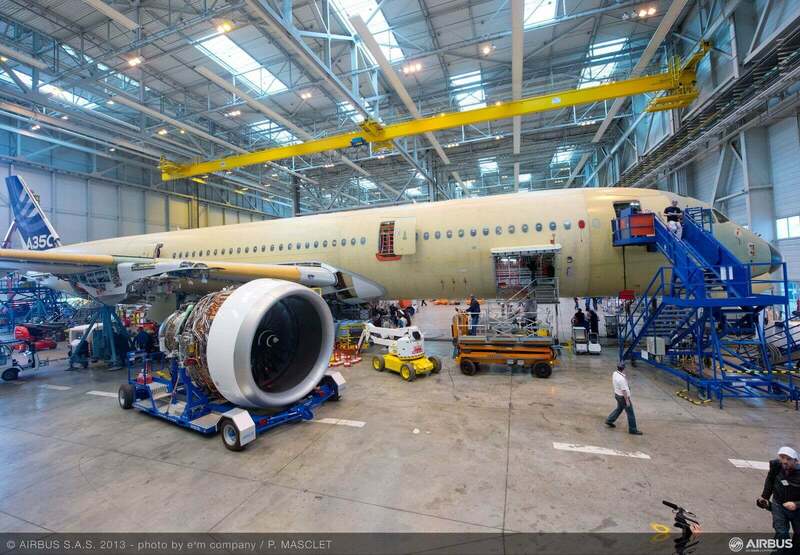 This means, there’s a lot to expect of this FlightFactor aero A350 and I can tell you already, you’ll be surprised. In other words, with such a brand new aircraft, at least at the time of this writing, it seems to be a very interesting X-Plane aircraft. Time to move on and see how easy it is to fly. Due to the length of this review, I’ve decided to include a table of contents. Hopefully this will help you finding the chapters of your interest. 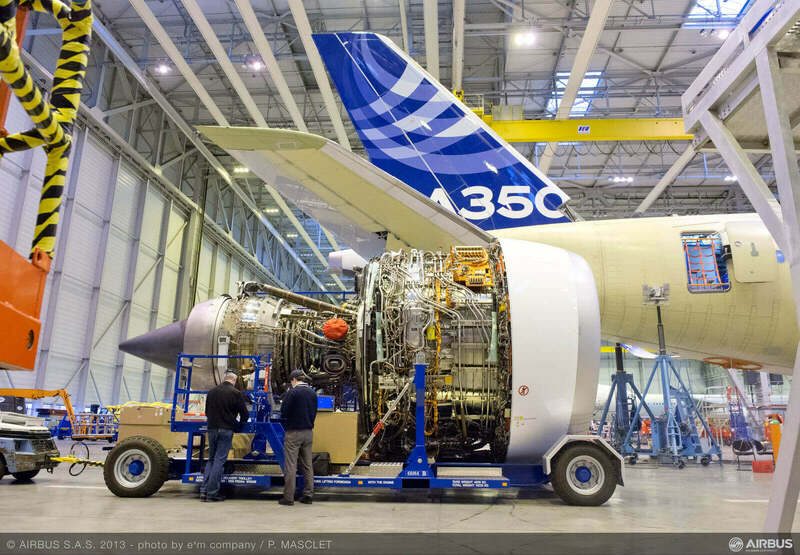 Chapter 7: Worth To Know … A350 trimming … yes or no? Chapter 9: Jumping In and Flying Away …? – Part III | What’s Simulated and what’s not? – Part IV | How does the flight deck feel? – Part V | And how does the virtual cabin feel? 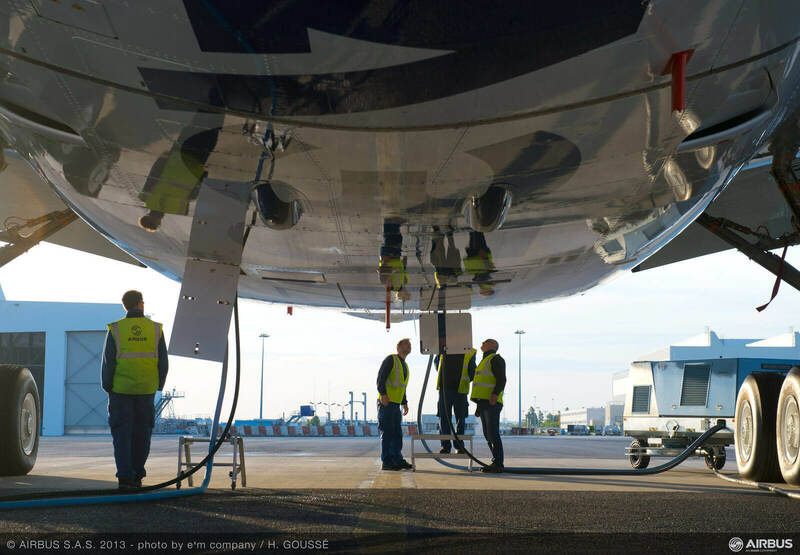 – Aircraft termination and …..
A350 … 25% lower fuel costs, no compromise on comfort. 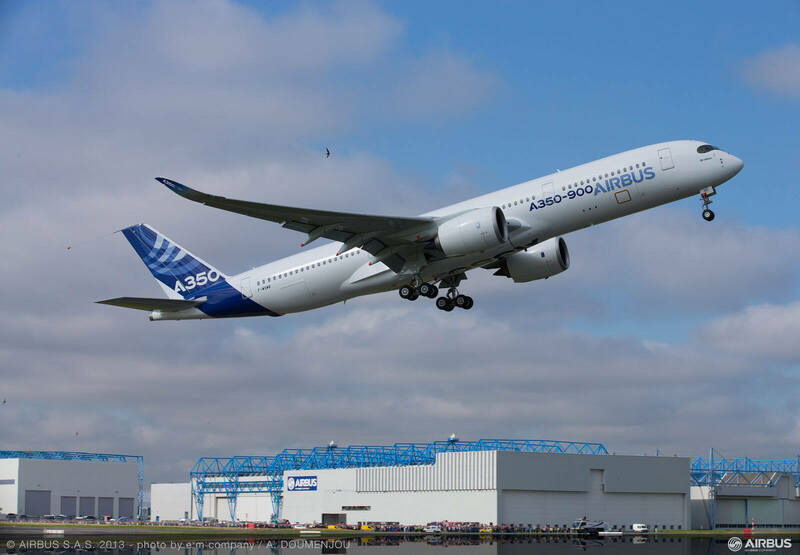 The A350 XWB twin-engine jetliner is shaping the future of air travel by offering a complete family of new-generation aircraft that is best suited to the market’s requirements for size, range, revenue generation, passenger comfort and the environment. 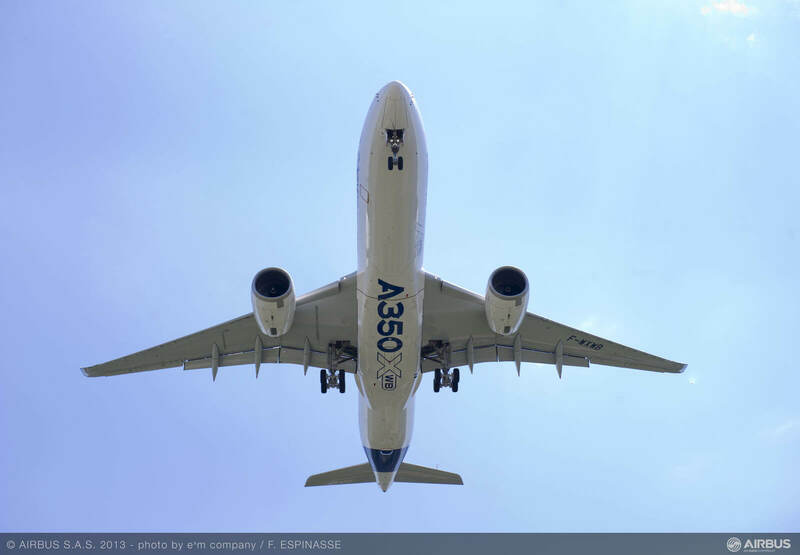 Over 70 per cent of the A350 XWB’s weight-efficient airframe is made from advanced materials, combining 53 per cent of composite structures with titanium and advanced aluminum alloys. 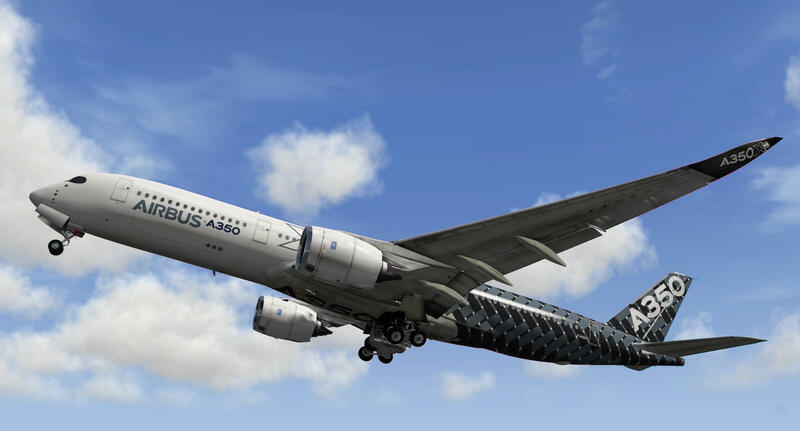 The aircraft’s innovative all-new Carbon Fibre Reinforced Plastic (CFRP) fuselage results in lower fuel consumption, as well as easier maintenance. 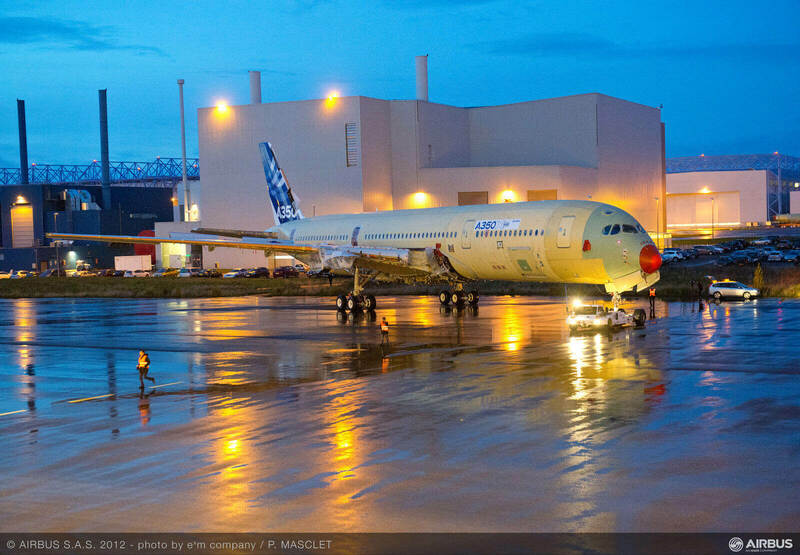 The A350-800 is the shortest fuselage version in Airbus’ new A350 XWB all-new family of mid-sized widebody airliners. 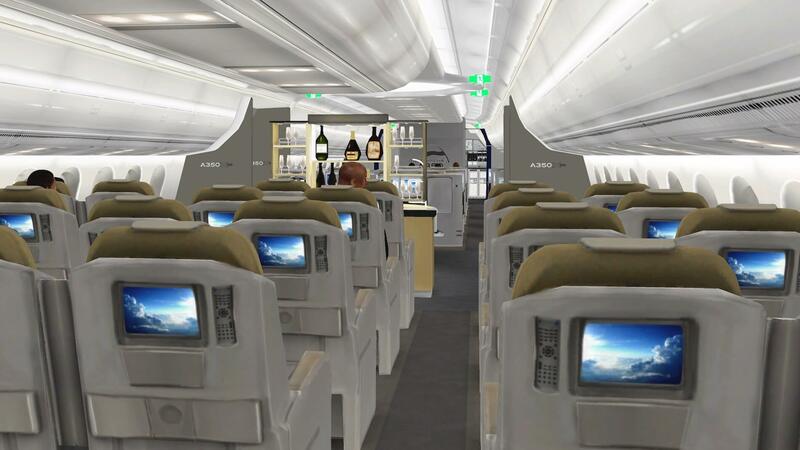 It accommodates 276 passengers in a typical two-class cabin, with a flight range of 8,250 nautical miles. 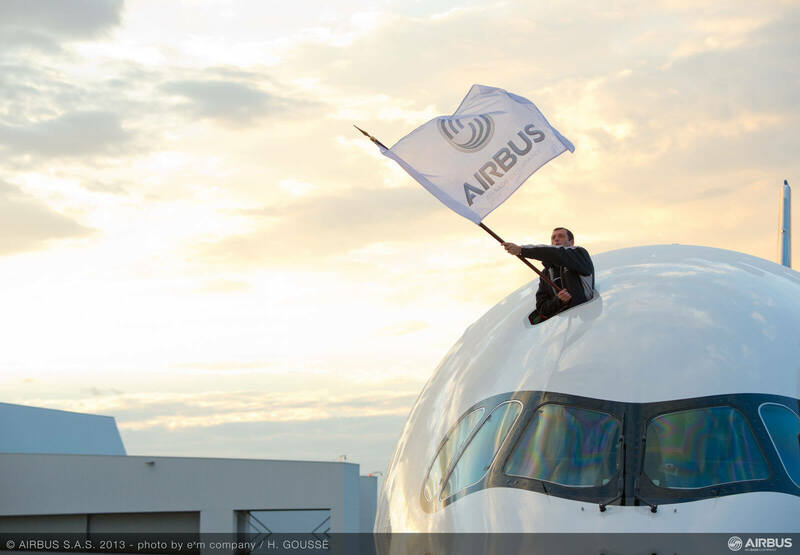 The A350-900 is the cornerstone member of Airbus’ all-new A350 XWB Family, which is tailored to meet airlines’ future market requirements in medium-to-long haul operations. Measuring nearly 74 metres from nose to tail, the A350-1000 is the longest-fuselage version of Airbus’ all-new family of widebody jetliners, which is designed for high efficiency, maximum reliability and optimised performance. 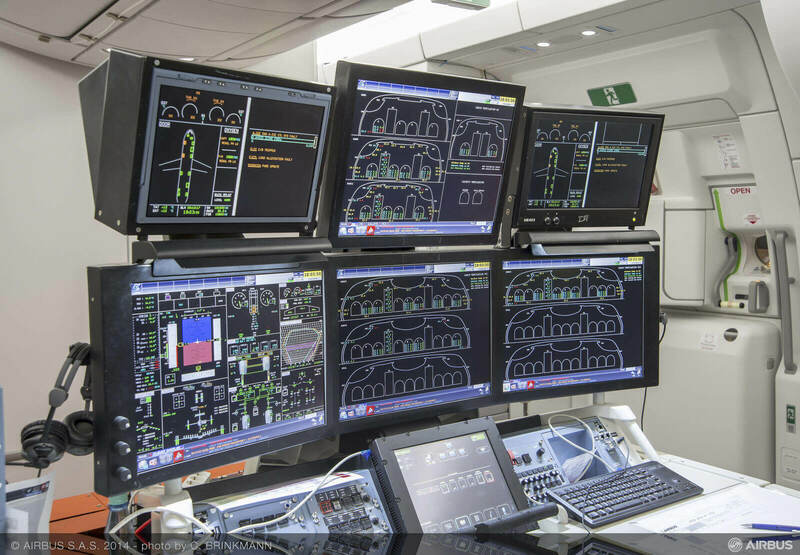 The avionics will be a further development of the integrated modular avionics (IMA) concept found on the A380. 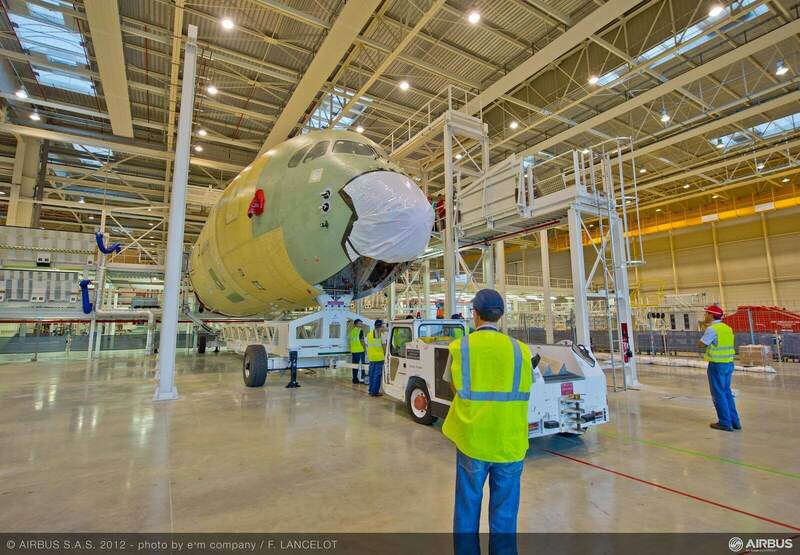 The A350’s IMA will manage up to 40 functions (versus 23 functions for the A380) such as undercarriage, fuel, pneumatics, cabin environmental systems, and fire detection. Airbus says benefits will include reduced maintenance and lower weight because IMA replaces multiple processors and LRUs with around 50% fewer standard computer modules known as line-replaceable modules. The IMA runs on a 100-Mbit/s network based on the avionics full-duplex (AFDX) standard, already employed in the A380 instead of the architecture used on the A330/A340. 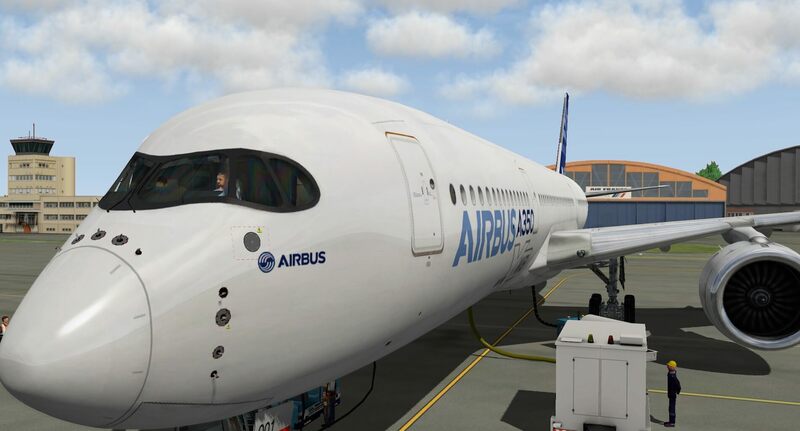 Before using the Flight Factor A350, you need either an offline or online activation. For online activation or validation which is the fastest way, an Internet connection is needed. This is the only way to protect the aircraft package for piracy and listening to many XP developers, it seems to be a secure and effective system. When you own for example other Flight Factor aircraft, or the SSG 747-8i Advanced, the JARDesign A320neo or Peters aircraft A320/A321 Series, you’re for sure familiar with this validation process. You are free to install the package where you want by just copy and paste of the downloaded contents. Either you copy and paste the A350 in the “Heavy Metal” aircraft folder, or you create a aircraft sub-folder “Commercial Aviation” or when you own other flight Factor products, a sub folder named “Flight Factor”. Feel free to do what you feel is logical for you! 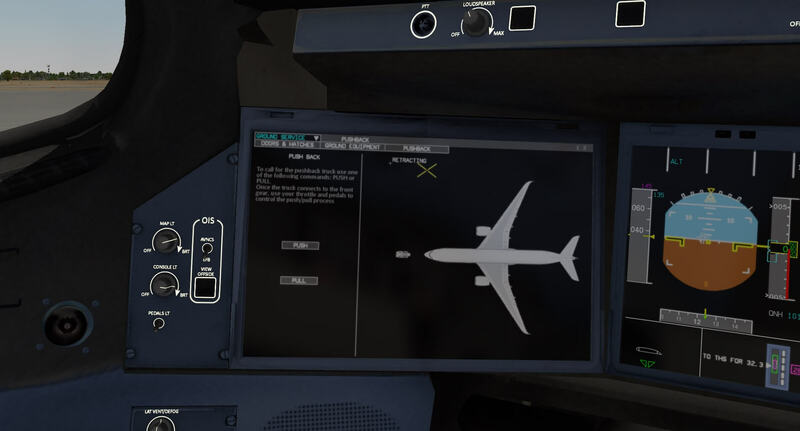 In the A350 root you’ll find an Airbus look-alike Acrobat document named “briefing”. I purposely wrote “look alike” since this Acrobat manual partly contains real Airbus A350 XWB pilot information together with Flight Factor information. That said, the briefing manual is only 218 pages. You can decide to print it, but that means a lot of paper but even more ink you need. I leave this up to you what you decide. On the other hand, the whole manual is always with you on board your flights. Oops, what’s that? Very easy … the complete content is directly accessible on the captain’s OIS (Onboard Information System). 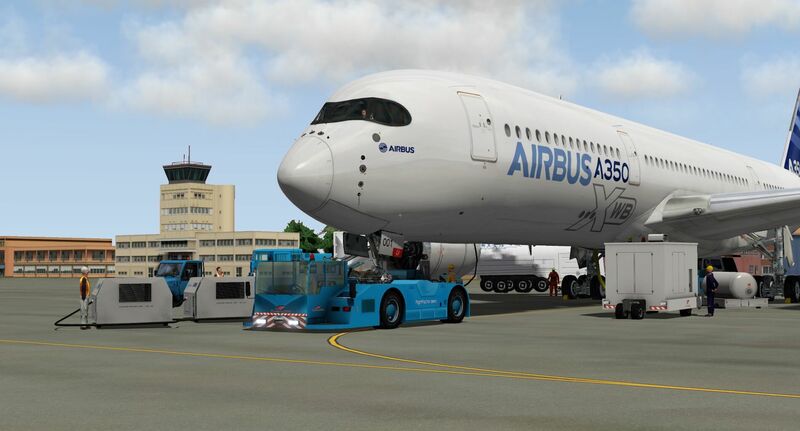 – Flight Factor A350 related pages. – Airbus A350 related pages. The “Flight Factor A350 related pages” cover the introduction, Flight Factor model classification, how to install (what you most likely did already), support and troubleshooting, X-Plane joystick and shortcuts assignments and finally, using the OIS (Onboard Information System) and MFD (Multi Function Display). 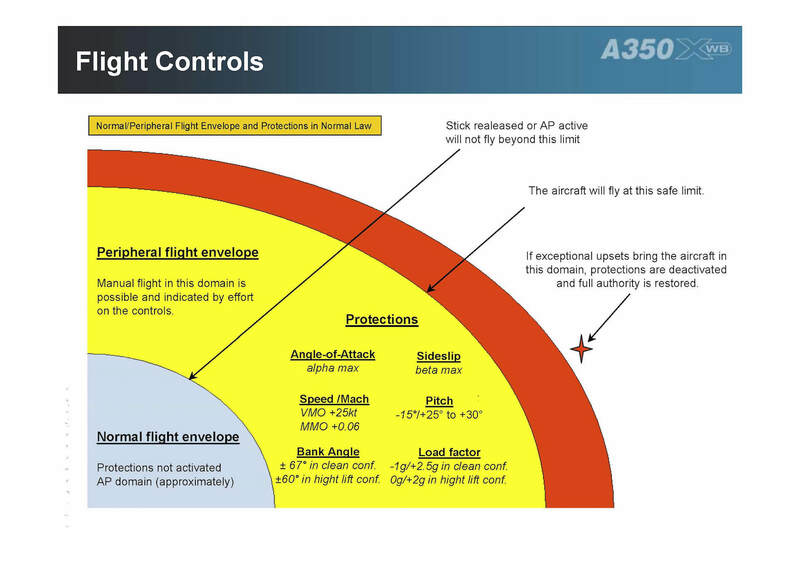 The “Airbus A350 related pages” are essentially based on the original A350 Flight Deck Briefing document with the exception of some pages. This part of the manual covers all aircraft systems in detail, and so is altogether a lot of information to read! Remember that this Airbus section isn’t of the same depth as the official A350 FCOM or other technical manuals. When you don’t own the Flight Factor aero A350 yet, you can check out this link that leads you directly to the official Airbus A350 Flight Deck Briefing Acrobat document and see for yourself in advance what the real A350 offers, which is more or less the same for the modeled Flight Factor A350 Advanced besides some systems like the use of the X-Plane default FMS database. I could start with my thorough walk-around inspection, but I think it’s better to explain a little more about the on-board modeled OIS, LH and RH MFD and the popup MCDU. The reason for discussing the OIS first, is because it offers a lot of useful information and it’s also the control center to modify, manipulate or include features. No no, no more mystery sentences, let’s start with the OIS description and operation followed by the MFD. Most functions speak for themselves however, a few need additional attention. With the “MFD Control” you’re able to control and operate the OIS and MFD screens via a popup window or on the screen in situ. 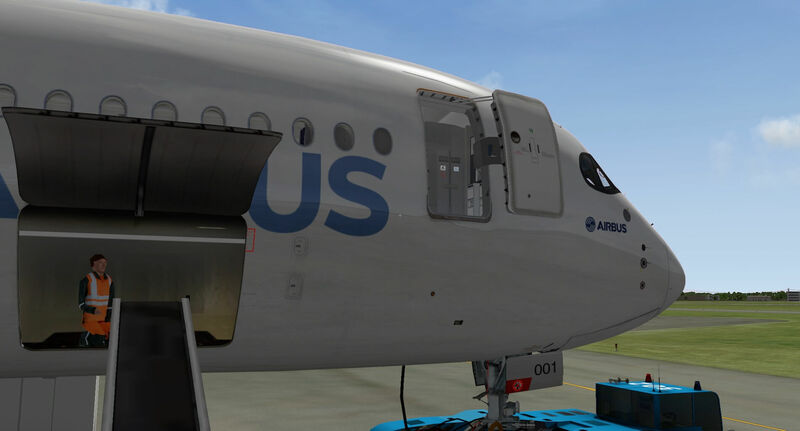 When you click the “Doors & Hatches” button, you get an overview of all passenger and cargo doors. Note that all passenger and cargo doors are functional except for the passenger doors 3R/L. The “Ground Equipment” page lets you control al kind of ground equipment ranging from GPUs, high Pressure supply units, buses, fuel truck, loaders, to stairs etc. 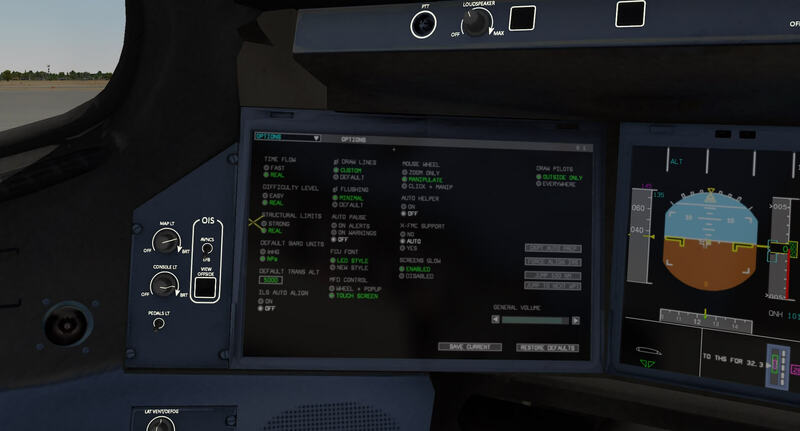 It also offers an “Auto Config” button that sets up the A350 directly in the correct basic ground configuration with the basic ground equipment around the aircraft. On the right of the page you’ll find a Maintenance button, however this failure system isn’t implemented in this Advanced model. The following screenshots are taken with “Screens Glow” being enabled. Screens glow can be found on the OIS page Options. When enabled it gives all the DUs (Display Units) a slight softy or blurry look. This in in particular visible with the sphere of the PFD. When this option is disabled, all DUs have sharp crispy text and images. The last sub page is “Pushback”. You can perform a push or pull. The rest of the page is self-explanatory. 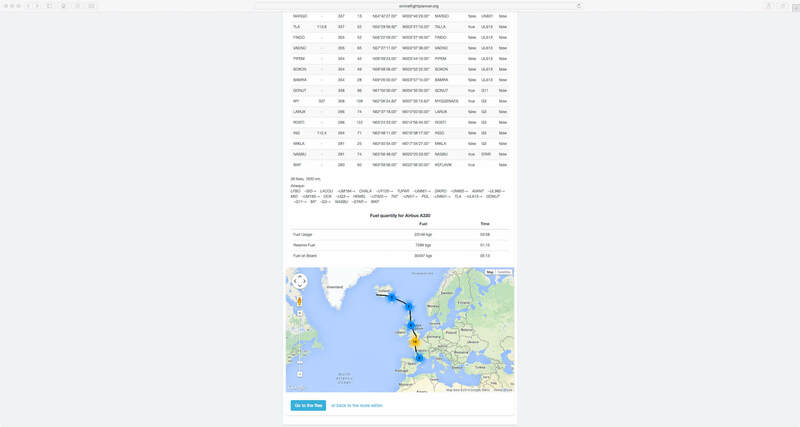 The aircraft weight and fuel page is divided into a passengers and fuel sub page. When you click the Passenger button, a synoptic of the upper deck and lower deck (cargo with LD3 containers) is presented. 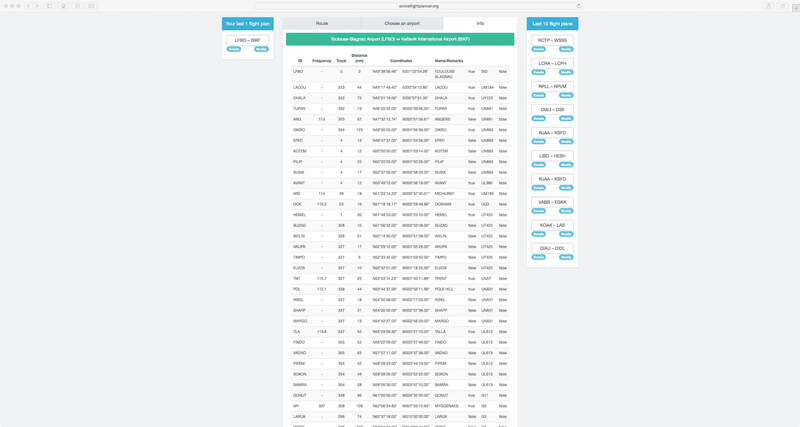 You can select per class (first, business and economy) as well as the number of crew members, the number of persons. When you enter a value too high for the respective class or too many crew members, the value changes into amber and a fault message comes into view. The same idea can be found for the cargo compartments except for the BULK area. When you don’t want to select per passenger, crew member or LD3 container, then you can go for one of the three preselected loads. These are identified as “Light”, “Middle” and “Heavy”. When you click one of the fields to enter the kilograms (pounds) or minutes, the “key input in progress” automatically becomes active. Great words for you can enter via your keyboard the value you want. This idea is the same for the number of passengers, crewmembers or LD3 containers. This page gives you access to cabin related items like controlling the cabin lighting. Further on, you can control the DOOR SLIDE status. Actually, you can place the door slide system in AUTOMATIC or MANUAL. For your information: MANUAL means that the door slides system is disarmed and that when opening the passenger door(s), the slide(s) won’t deploy. In AUTOMATIC mode, the slide system is armed and when then a passenger door is opened, the slide will deploy for evacuation purposes. On the same window you’ll find on the right hand side the water tank quantity in percentage between 0% and 100% as well as the lavatory waste quantity. This page allows you to play cabin announcements. Just select the announcement of your choice, click the PLAY button and the announcement will be spoken. This can be seen by the green IN USE text on the page. When you don’t hear anything, be sure you have the PA volume selector, situated on the captains RMP, switched ON and that the selector is illuminated white/light grey. Just to be sure, I’m not talking about the PA switch above the PA selector. In the Flight Factor A350 folder you’ll a sub folder “Charts”. By default this folder contains already some chart folders namely EBBR, EDDF and LGAV. Further on, you also find two files: “pdf2png.jar” and “pdf2pngHD.jar”. What can you do with these Java files and what’s the result? What you first need is Acrobat files from the airport. 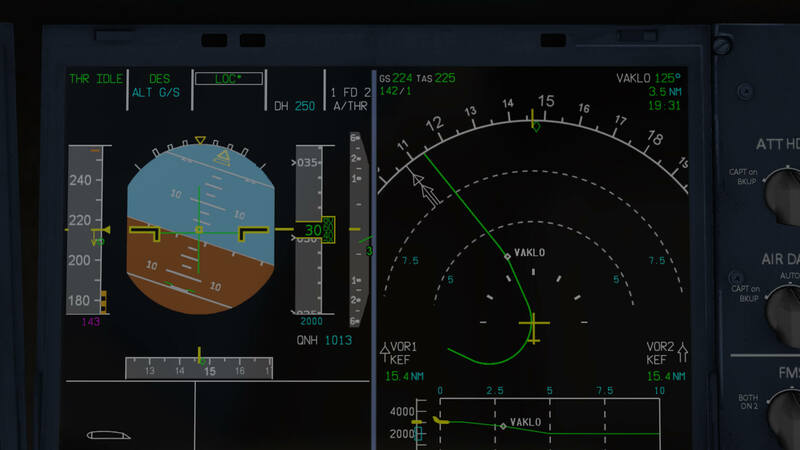 When you have an airport package consisting of Acrobat ground movements, SID and STAR charts as well as ILS or RNAV approaches, you can use the “pdf2png.jar” or “pdf2pngHD.jar” file. The “HD” means that the generated png files are of a higher resolution. When you’ve placed the Acrobat file and the respective “jar” file in a folder, you simple click the Java file and automatically a folder with png files is generated. Rename the created folder with its ICAO airport name and place the created folder in the A350 Charts folder. The reason is that you can check out these charts on the OIS while parked at the airport. You can call up these png files via the OIS for your departure and/or arrival. Think about it, the possibilities are “almost” unlimited. 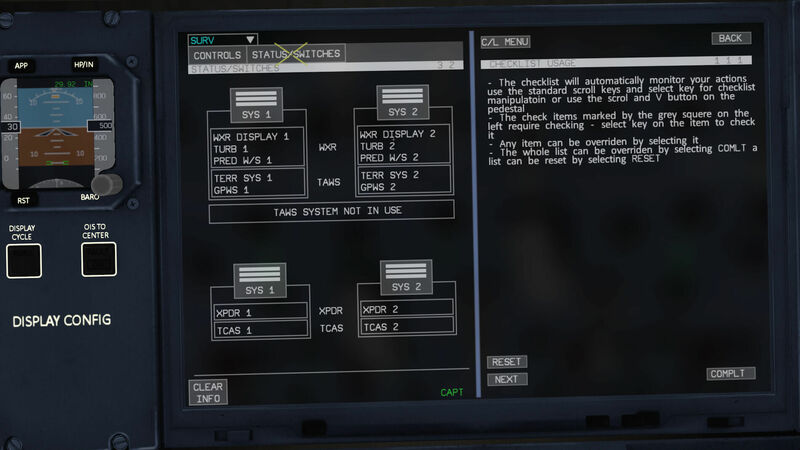 The right hand MFD offers by default the C/L menu (Checklist menu). You can swap the left and right hand MFD images with the left hand DISPLAY CYCLE pushbutton. The right hand DISPLAY CYCLE pushbutton isn’t functional. Next to this DISPLAY CYCLE pushbutton you’ll find the OIS TO CENTER pushbutton. When you click this button, the complete OIS replaces both MFDs, but they reappear on the captain’s DU which was previously showing the OIS. I first start with the FMS 1. This page and the many subpages are actually the same, or let’s say, similar to the old-fashioned FMS MCDU. The look is different since there’s no keyboard, however you can use your computer keyboard or the simulated KCCU (Keyboard Cursor Control Unit). 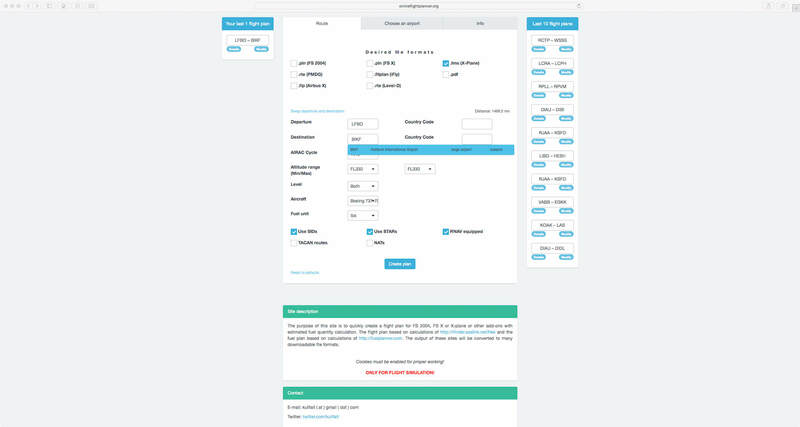 The SURV page (“surv” is the abbreviation for surveillance) is a screen and backup version of the surveillance control panel on the pedestal. This control panel allows the pilot to control the weather radar and TCAS. 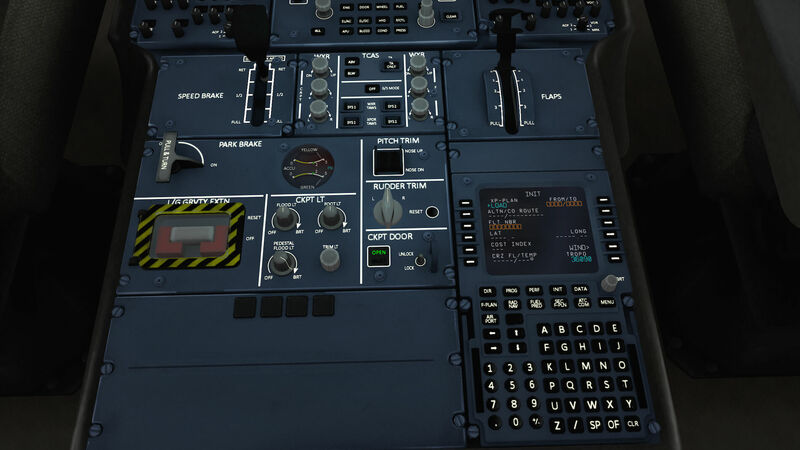 Also, some MFD pages can also be requested via the KCCU top row buttons. The FCU backup in the MFD is, as the name suggests, a backup for the “AFS (Auto Flight system) panel” and the “EFIS control” panels. 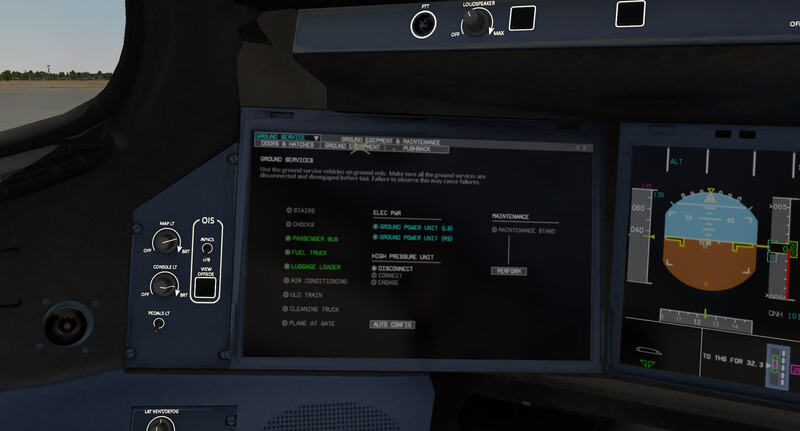 The only real and simulated reason to have this installed in the real and Flight Factor aircraft is that these functions can still be used in case the “hardware panels” should fail. OK, the MFD FCU BACKUP has two sub pages, namely “Autoflight” and “EFIS”. 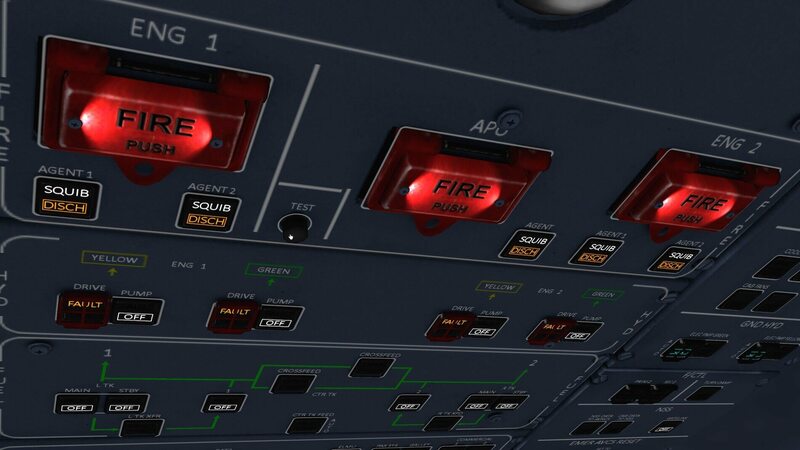 When you click the Autoflight software button, the whole AFS panel pops up on the MFD. 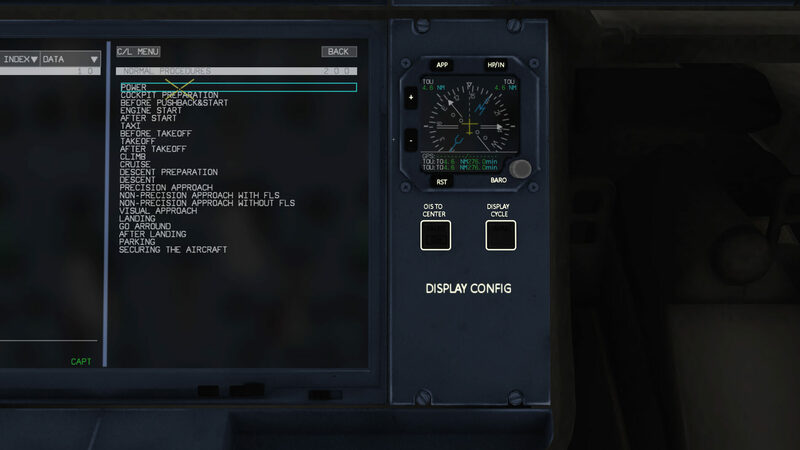 Click the “Autoflight Back-Up” software button on the MFD and everything below on the MFD becomes active. Now you can adjust or changed settings as you normally do on the AFS panel. When you click the EFIS control button, the same can be done as described in the Autoflight section, but now related to the EFIS control panel. Some words about the, by default, right hand MFD with the interactive normal procedures checklist. If you know the Flight Factor 757, then basically this A350 follows the same idea. Checklist items are colored cyan (light blue), and the message/line becomes green when you’ve checked it or when you’ve performed the correct action. When you click on a cyan colored line and you don’t perform the action or an incorrect action, the line turns magenta (pink). The above screenshots show you the MFD. On the left hand side you can select the FMS, SURV, FCU BKUP and ATCCOM pages. On the right hand side you’ll find the electronic checklist. Underneath the ISIS instrument, you find DISPLAY CYCLE and OIS TO CENTER pushbuttons. With the DISPLAY CYCLE you swap the two MFD displays. With the OIS TO CENTER, the captains OIS moves to the center (pedestal) position and the MFDs move to the captains OIS position. And finally there’s the popup of the MCDU (Multi function Control Display Unit), situated on the rear left hand of the pedestal. In the real aircraft you won’t find a MCDU here. Instead there’s the third RMP (Radio Management Panel). The built in MCDU is fully functional, but for your convenience you can click on the display and a MCDU 2D pops up. Very handy, the same as the 2D popup displays of the MFDs and the OIS. What else is important to know before I can finally start with my thorough external inspection? In the real A350 you will find in front of the captain and co-pilot a foldable keyboard. 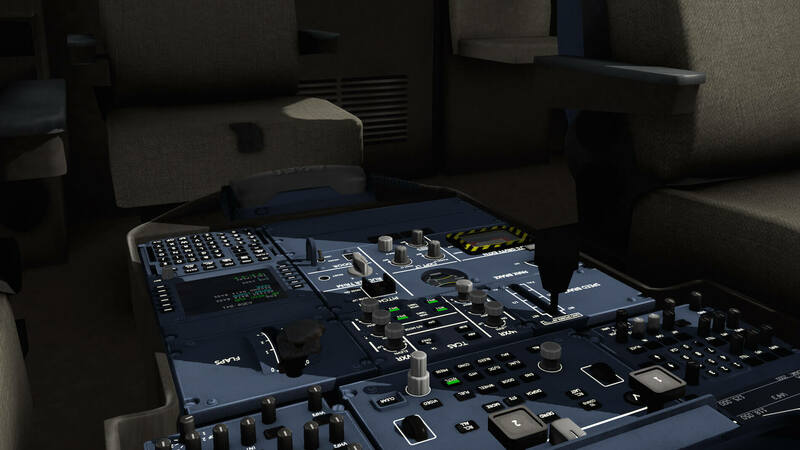 The simulated Flight Factor A350 Advanced version offers a foldable but non-functional co-pilot keyboard. On the captain’s side the keyboard is not foldable at all. Being at the captain’s side in the flight deck, according to Roman “the HUD (Head Up Display) isn’t yet functional”. Oops, almost forgotten ….. the co-pilot’s OIS. This OIS isn’t functional and shows a static page of the flight controls Normal Law. Finally, I think I’ve reached the end of this section. Now it’s time to do my thorough walk-around inspection. 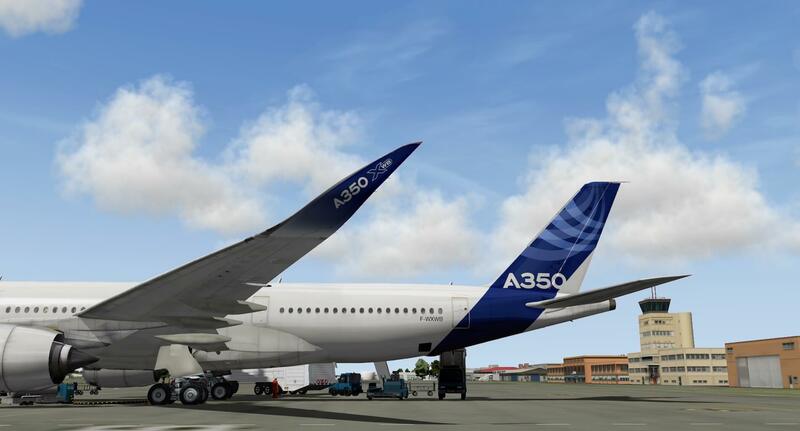 Worth To Know … A350 trimming … yes or no? 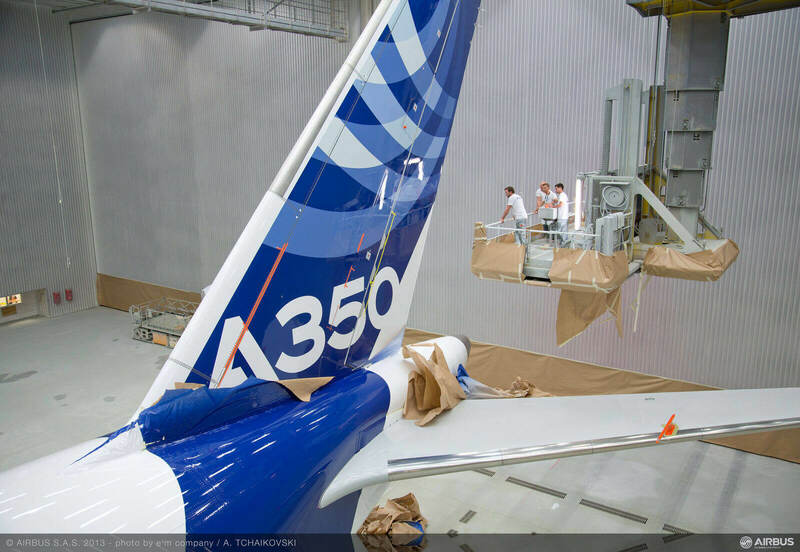 Question … do you need to trim the A350? Do you need to trim for example the ROLL and PITCH channels under normal flight conditions? An interesting question isn’t it! To answer this, I could find it out myself, but it’s better to ask one of the Flight Factor A350 beta testers, Marcelo Alencar. Marcelo is an active ATPL pilot flying for Qatar and yes, he’s an acting captain on the Airbus A330 Series as well as instructor and also flying the Airbus A340-600. According to Marcelo “None of the FBW Airbuses has a trim switch on the sidestick. Airbus has what we call “auto trim” and this is directly linked with the flight control laws. On the A320, A330 and A340 you still have the trim in case you end up using a mechanical backup. There you can see the trim wheels moving, but you can’t interact “command” them. If you degrade to a direct law or mechanical backup, than you can use the trim wheels to control the pitch. 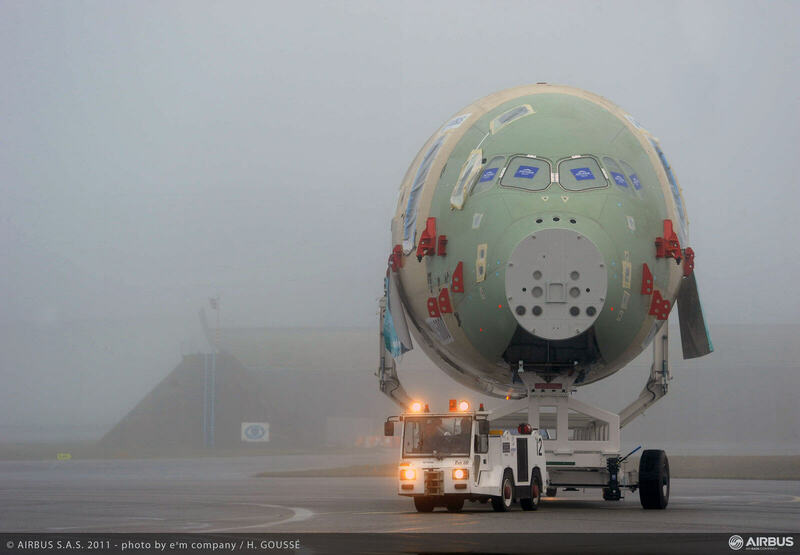 This is very difficult to maneuver and as per Airbus, it’s very unlike to happen! Hold on …. 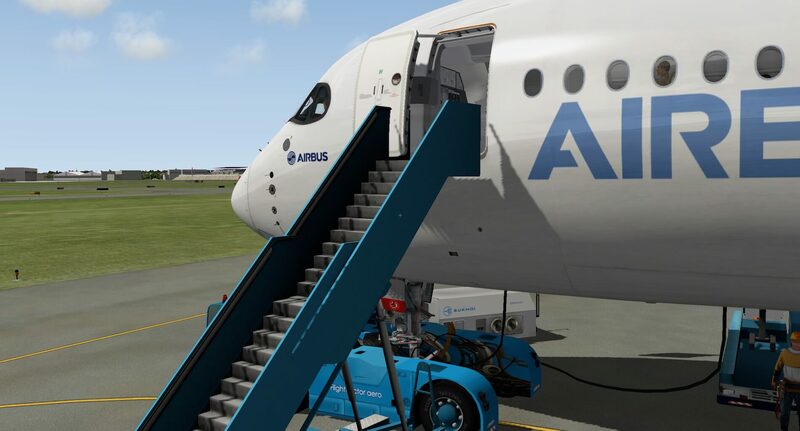 the Flight Factor A350 isn’t the only X-Plane Airbus aircraft that uses Auto Trim. 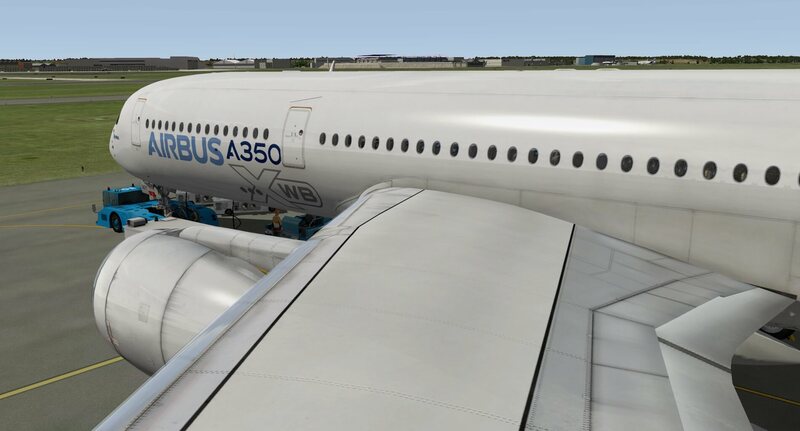 In fact every payware Airbus has some kind of Auto Trim. 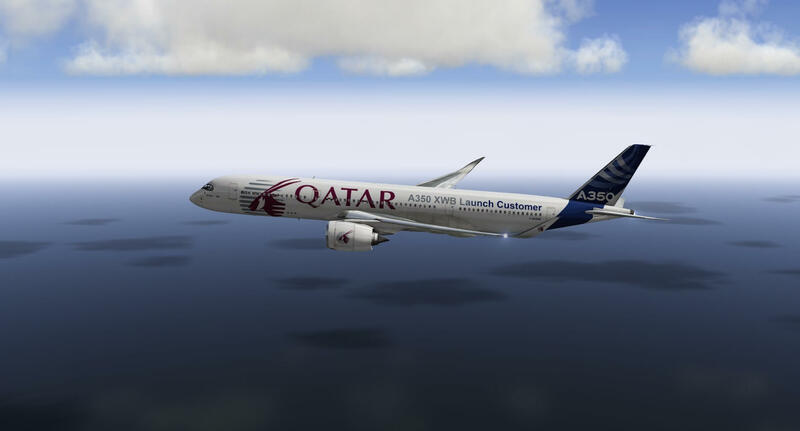 For example, the JARDesign A320neo, the QPAC’s A320 which uses the same plugin as the Flight factor A350 and not to forget Peter Hager’s Airbus aircraft collection for XP10 which is again using the QPAC’s FBW-plugin. 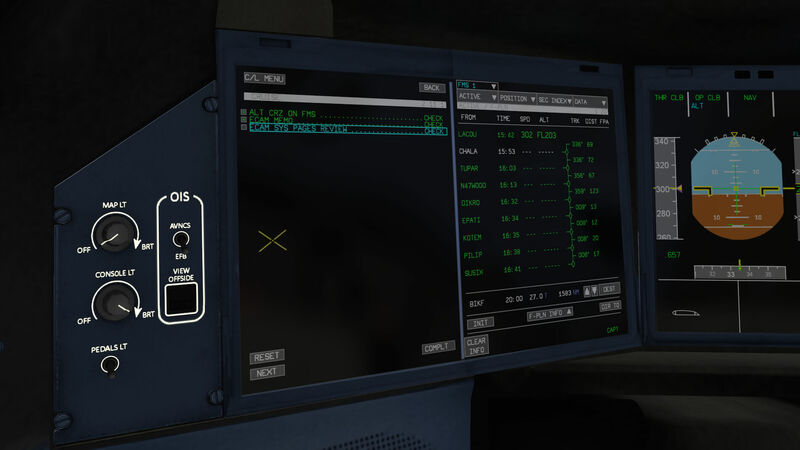 All these aircraft have realistic Auto Trim systems. For my test Airbus A350 I decided to do my walk-around inspection at the Alpha Bravo parking area of LFBO (Toulouse/Blagnac Airport). For those who aren’t familiar with LFBO, this is one of the older parking areas used for arriving and departing aircraft during the old days at Blagnac airport. Walking from the old terminal to the parked A350, I’m so happy to say that from a distance while walking to the aircraft, it’s unmistakably a well-modeled 3D A350 model, but how is it when doing a close-up inspection? Let’s check that out. Before doing anything, I want, at this early hour of the day, also to check the external lights. Therefore, via the modeled stair, I go to the flight deck, switch on the external power and all the external lights. To switch on the external power, you need first to switch on the batteries, and then via the captain’s OIS, the external GPUs. In the real airplane, the green external power AVAIL lights are already active the moment the GPU is connected and voltage and frequency are OK. 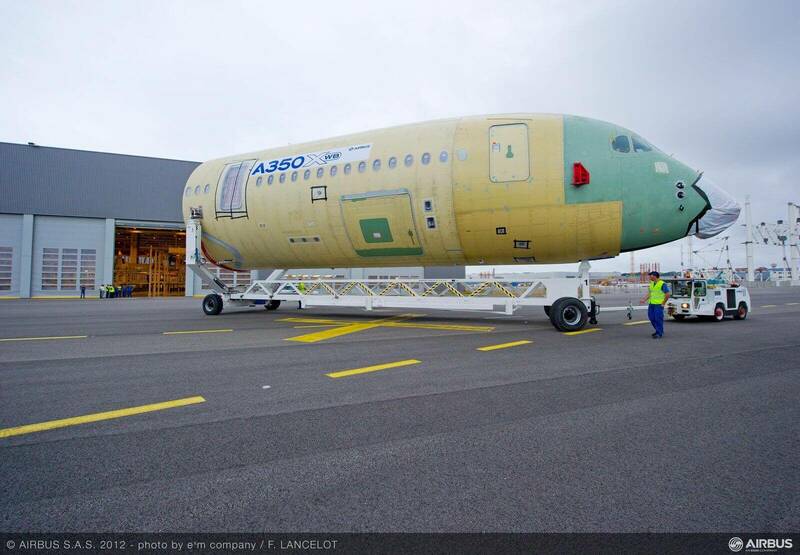 This is, according to Roman, differently modeled in the A350. With all the external lights illuminated, I’m ready to start my external check. As I wrote before, the overall model is typically an A350-900, this being the aircraft variant that’s modeled. But even close-up inspection of the NLG (Nose Landing Gear), MLG (Main Landing Gear), engine inlets and cowlings tells me that the gears, gear doors and engine shape are all very nice although I have to admit that I can’t find many really good close-up A350 landing gear pictures. 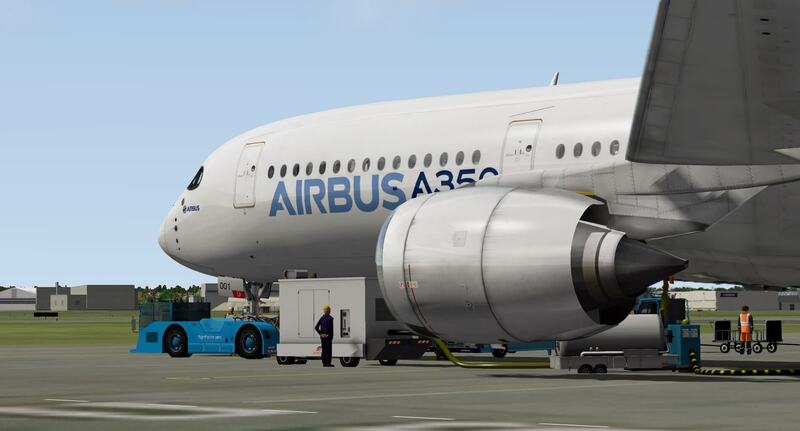 Since I’ve never touched a real A350 gear, I’m not 100 percent sure about the modeling, but it feels good. The gears are slightly dirty or perhaps weathered is a better word. 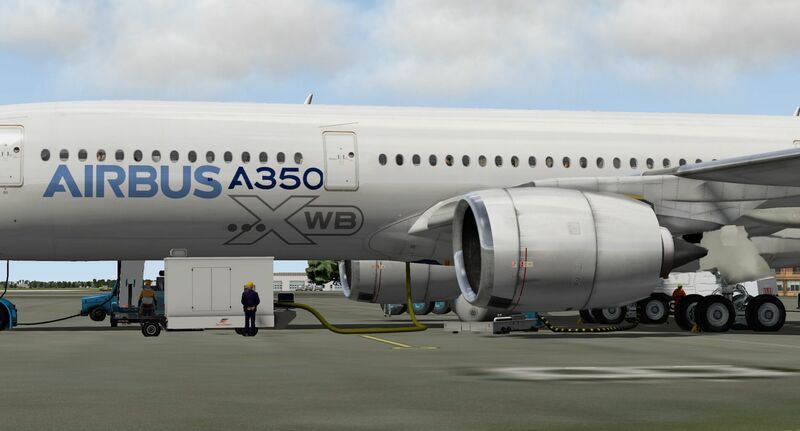 Some simmers will say that this is not realistic since the real A350 is almost a brand new aircraft. Others will say that the gears, even if they a couple of weeks old, before you know it, they will be dirty. Based on my own real ground engineer experience, I must say that even with brand new aircraft, landing gear are, before you know it, dirty, and cleaning them with high pressure isn’t allowed because this could remove the grease on all the hinges, linkages etc. Therefore, the way the gear is made dirty is in my humble opinion realistic and don’t forget that first A350 flew some months ago. Anyway, the dirty fuselage belly look is for some simmers again something to discuss. 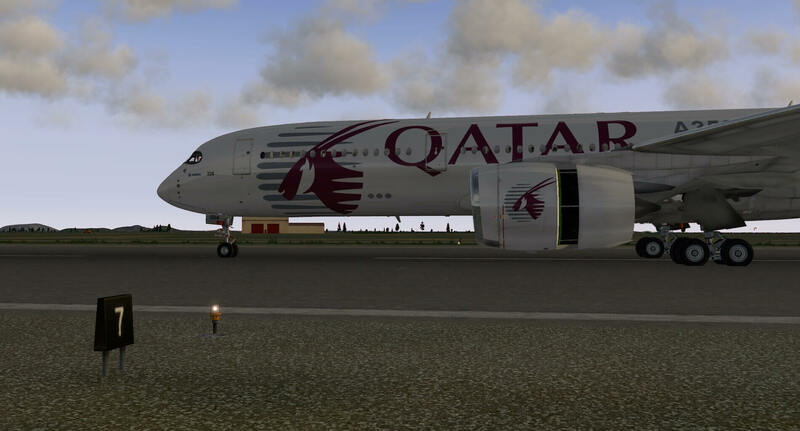 Some like it, while some simmers prefer a cleaner look because it’s a brand new aircraft. Suppose it’s a brand new aircraft, suppose it’s for the launching customer Qatar, then even after a month the belly isn’t new anymore and cleaning helps, but you never get it as it was at delivery. Long story short; I like the slight dirty or weathered look of the gears and fuselage belly, but the textures on the strut and wheels aren’t really sharp. I miss a little bit the tiny details, especially when you zoom in on the struts. This is the same for the MLGs too. Further on, I have my thoughts about the presence of the ground personnel situated around the aircraft near the NLG and FWD stair. I personally would prefer that you could select the ground personnel on the OIS ON or OFF. The reason for this thought is that I find, yes, it’s a personal feeling, the overall quality of the persons not so impressive. I highlighted already the look and feel of the RR Trent engine cowling, inlet and exhaust. The overall look is good including the crispy decals. Looking at the engine pylon, I’m a little surprised about the size of the rivets and/or bolts. The engine pylon skin has a lot of panels and therefore a lot of rivets which can be clearly seen, but I feel that the size of the rivets is a little bit over the top. Normally you won’t see the rivets that clearly since they are quite small in reality. With a stair near the wing tip, I’m able to check the top surface of the wing too. It looks very nice, realistic, but the mid wing area between the FWD and AFT stringers is dark grey and weathered or dirty. This is not real. The top of the wing, based on my real experience, stays most of the time quite clear and equally light grey. Continuing with the wingtip, I really like the way the wing fence is modeled. It all depends on the livery and the Airbus and Carbon livery bring the fence to life. But the moment I reach the tail with the horizontal and vertical stabilizers as well as the APU exhaust I’ve got a big smile on my face. This is nice 3D modeling and very accurate as far as I can tell, compared with the available A350 XWB manuals. 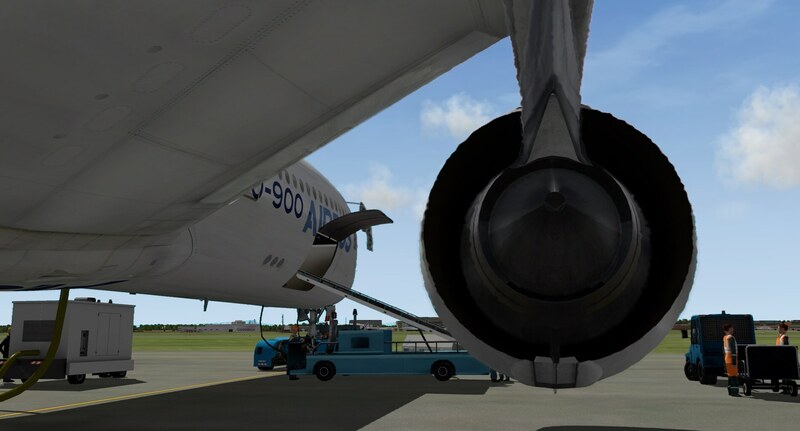 I walk back via the right hand fuselage, have a quick look into the AFT and FWD cargo compartments and stop for a moment at the right hand MLGs. By the way, the BULK cargo hold at the AFT left hand fuselage is also modeled. As long as it’s covered with textures, it’s OK with me. While approaching the nose of the fuselage, I look once more up and see the characteristic windows. 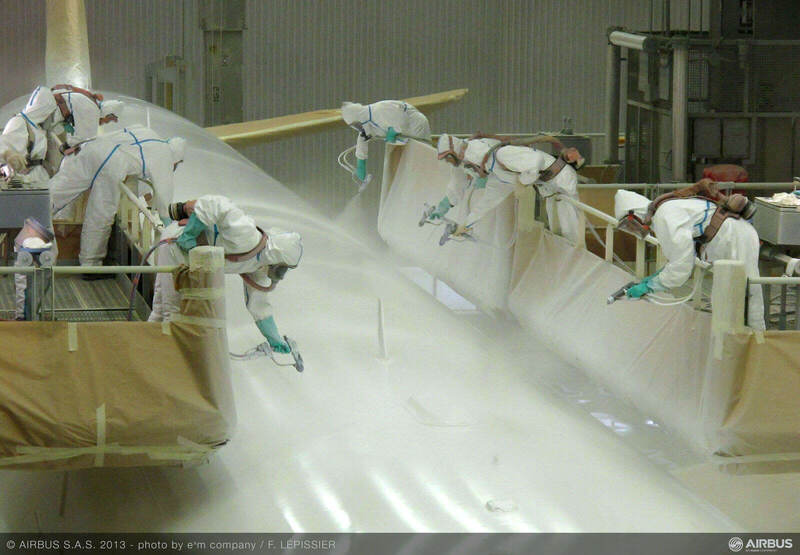 It is not just for fun that they are made in this way; there is a special reason why Airbus designed it this way. According to Airbus “A big challenge in A350 XWB going to curved windows is that curved windows are much harder than flat windows to optically match to the HUD (Head Up Display), which both these aircraft offer. The optical quality controls on the curved glass are extraordinarily tight, to be able to certify the HUD for takeoff and landing. Aerodynamics departments don’t like flat surfaces in general. But there is also another key factor; visibility for pilots; they hate not being able to see. Airbus made in 2008 a revision that changed the shape of the upper radius and upper shell of the fuselage for aerodynamic reasons. 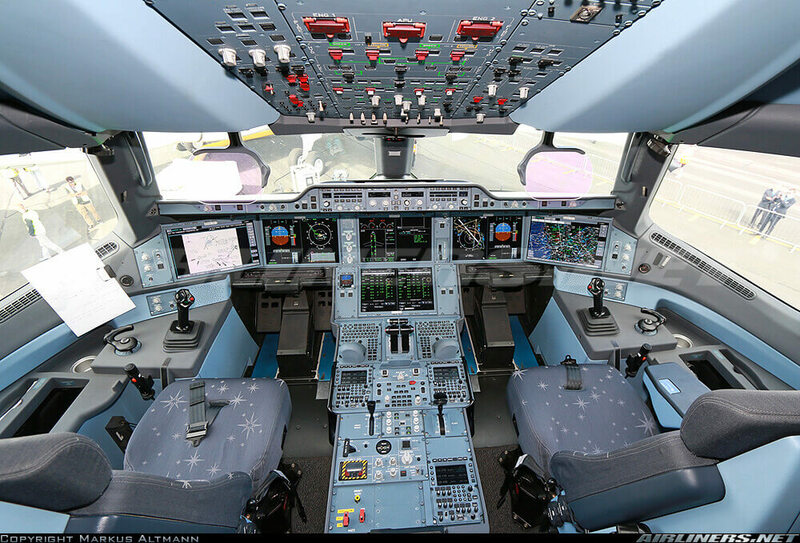 Airbus refined the six-windscreen layout and worked to minimize the center post to improve the pilots’ visibility. Overall a very well 3D model and very nice textures! Not that it’s very important to know, but the Airbus Carbon color is definitely my favorite. Jumping In and Flying Away …? No, you can forget that although you can make it yourself as complicated as you want, you need to follow certain steps unless you decide to start X-Plane with engine running. Personally this is not my favorite and together with the n-board electronic checklist, there’s also no need for, but, yes, there’s a but! That “but” is finding all the things in the checklist items mentioned on the MFDS isn’t always easy, however, there’s also good news. An electronic checklist item is by default cyan (light blue). When you’ve performed an action e.g. a switch from OFF to ON, and this is detected by the electronic checklist system, the relevant checklist item turns into green. In some cases you need to check the status of something and when this is correct, you can click the cyan checklist message and then it turns into green. When you need to do something but don’t want it, you can always click on the cyan message which will turn into magenta (pink). Overall the electronic checklist is a very nice feature in this A350. Not really mentioned before, but I think now it’s the time to highlight this feature. 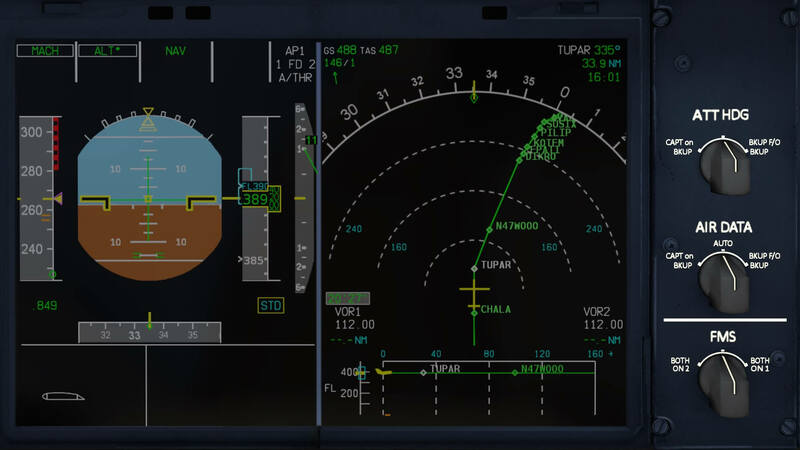 You can control the screen functions/selections on the OIS and MFD’s with the yellow X. With the mouse you move the yellow X around and with the left hand mouse button you make your selection. 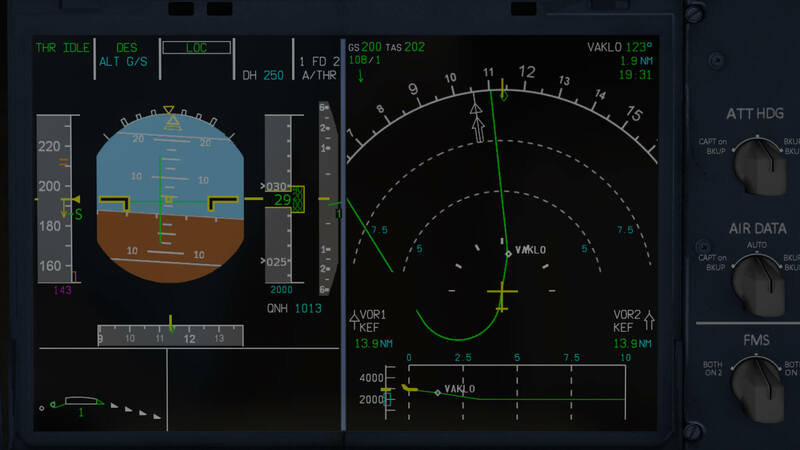 When for instance you need to enter a value like on the, by default LH MFD, FMS flight plan, you position your mouse with the yellow X to the field you want to change (amber dashes or cyan figures) and then click with the left hand mouse the field you want to change. In the MFD scratchpad you’ll see the words in amber “KEYBOARD FOCUSED”. Now you can enter the value you want either via your computer keyboard or via the fully modeled KCCU. Do you still remember what KCCU stands for? Ok, let me help you … Keyboard Cursor Control Unit. The modeled FMS isn’t using AIRAC updates from either Navigraph or Aerosoft NavDataPro. Instead, the aircraft utilizes the standard X-Plane 10 nav data, which can be updated with new data from Navigraph and/or Aerosoft NavDataPro. That doesn’t mean you can’t use the on-board FMS MCDU or the MFD, but with a few more limitations. You can select from the XP default database runways, but you won’t be able to select a SID or STAR. However, when you have created your own SID points for a particular runway with the help of real charts, you are able to load this via a “QPAC SPECIAL | SID FROM FMS FILE” and of course the same is applicable for the STAR file. Anyway, which or what program to generate a flight plan is good? It’s not really a part of this review, and besides that, it also depends which platform you’re using. 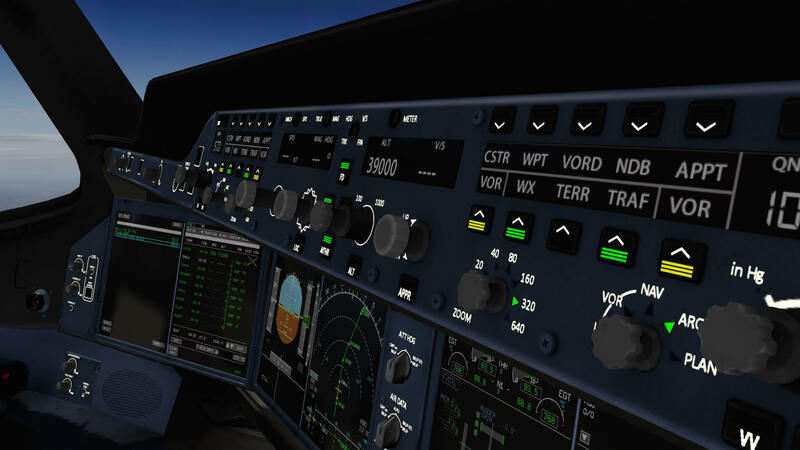 Are you an X-Plane Windows, Mac or Linux user? About Linux, sorry, I have no clue, but for the Mac there aren’t that many real payware or freeware flight-planning programs. For Windows X-Plane simmers there’s much more choice. But for me as a Mac OSX simmer I need to improvise and since Goodway can’t be used anymore with X-Plane 10, you and I need to look for other solutions. Of course, I could install under my Parallels Desktop for Mac a basic version of X-Plane and one of the payware or freeware flight programming programs, but I only use Windows when I have no other choice anymore. To create a flight plan you could use many programs, but let me highlight a couple of freeware possibilities. Let me start with Routefinder which offers you quickly a flight plan, but this is not in “X-Plane fms” format. If you don’t like Routefinder, you could check out FlightAware, but again, this doesn’t allow you to export it to an fms file format however, it offers real flight plans. Another very interesting website is simBrief. Register for free and a wealth of flight planning information becomes available. Thanks Michael for bringing this up! You could also go for the browser X-Plane Flight Planner. A very nice program – however, you need to create your flight plan yourself while the previous programs generate a “real” flight plan for you, as far as real can be. FlightAware is doing this at least. The advantage of the browser X-Plane Flight Planner is that you generate directly the X-Plane fms format and that’s good news. But there’s another possibility. I found the browser-based Online Flight Planner which seems to be a good one although I’m not 100 percent sure if the generated flight plans are as real as they should be. The good news is that it seems to do the same as RouteFinder, but with several export options, of which one is “X-Plane fms”. You can also enter the aircraft type, but right now the Airbus A350 isn’t on the list yet. I suggest for the moment to select from the list the Airbus A330. I’m happy, but the generated flight plan still doesn’t include a SID or STAR and it would be nice if I could add this to my flight plan, even when it’s in the A350 flight deck. Mostly for each runway you’ll have the option of more then one SID or STAR and the generated flight plan doesn’t include a runway, which is normal. Depending on environmental conditions and as decided by ATC, you’re assigned a runway and thus automatically a SID and STAR depending on which direction you go. Long story short; without Navigraph or Aerosoft NavDataPro you have no access to a SID and/or STAR unless you have the official SID and STAR charts of the airports on your route. 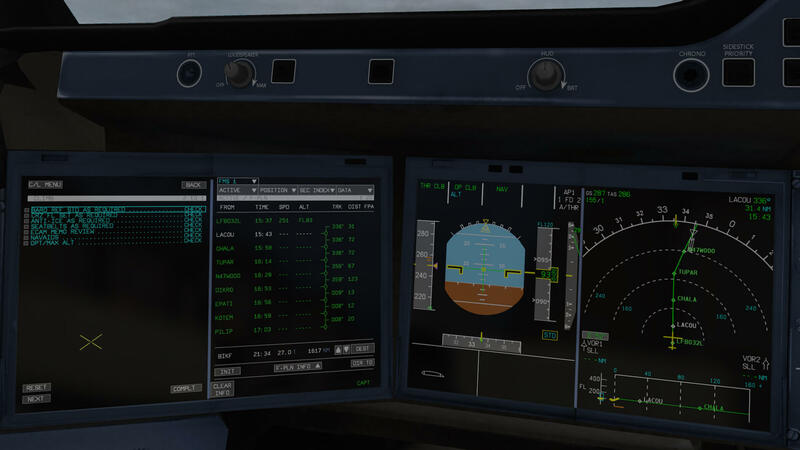 In that case, you can enter the SID or STAR waypoints in the MCDU or MFD. Once you’ve entered these SID/STAR waypoints, you’re able to save this SID/STAR in the A350. This is one of the A350 Advanced limitations. 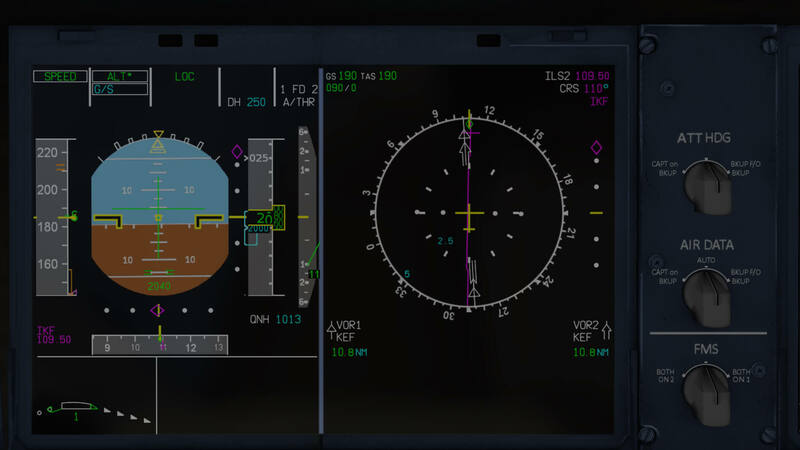 The A350 Professional allows you to use the NaviGraph AIRACs. Ok, where and how to install your created fms flight plan? Drop the fms flight plan file in the Output/FMS plans folder. Naming convention? Try to keep the flight plan names short, but name them not too short. You can use capitals or lower case in any combination. That’s it basically, when it comes to your flight plan and how to use it. 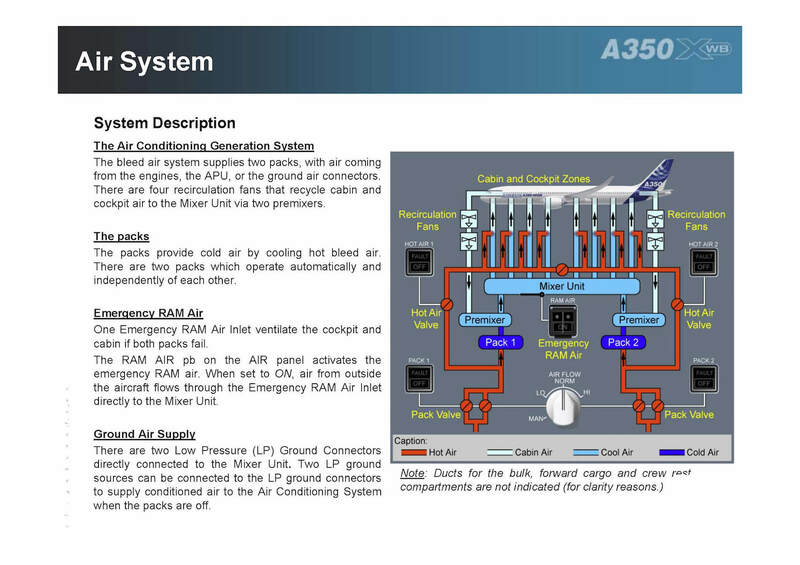 Further details can be found in the A350 briefing manual. Part III | What’s Simulated and what’s not? Doing the complete cockpit preparations is possible up to – let’s say – 97%. That said, 3% or perhaps even less isn’t simulated or has no output. Further on you need to keep in mind that the Advanced A350 doesn’t use an official AIRAC DB, but just the X-Plane FMS files. For those who are happy with that, believe me, there’s still some FMS preparation to do. 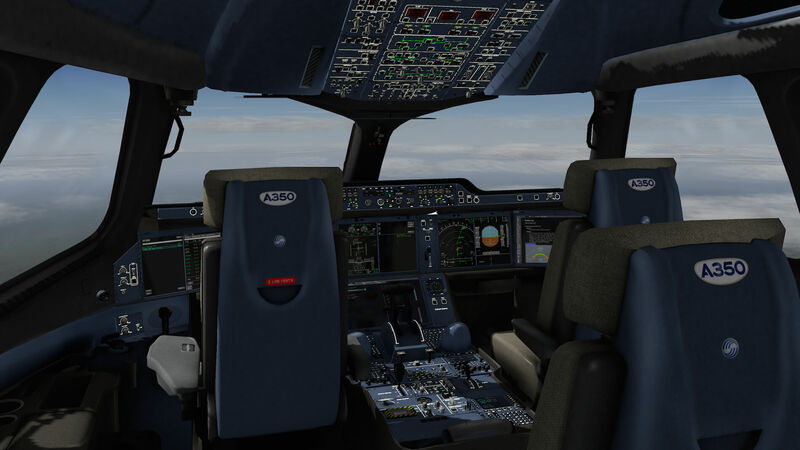 When you’re familiar with modern Airbus aircraft, you’ll notice that programming the FMS MCDU or via the MFD is easy and before you know, you’re done. The best is, I think you’re aware of that, to prepare a flight plan with the help of an external program or via the provided browser online program. Then you can load the whole flight plan for your route straight away and it’s as real as it gets. 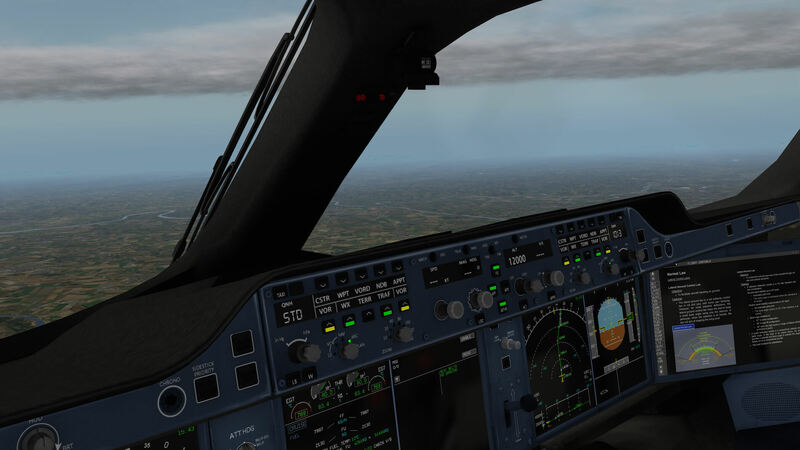 Although some simmers find “less simulated systems” a pity while others have no problems with it as long as the aircraft flies as real as it gets. I mentioned something before about some systems or items that aren’t simulated. For example; the co-pilots foldable keyboard is simulated in that way that you can slide it in and out, but the virtual keyboard itself isn’t functional. The captains foldable keyboard isn’t simulated at all which is also applicable for the co-pilots OIS. This screen shows only a static page of the normal law whereas the captains OIS is fully functional. And then there’s the question …. 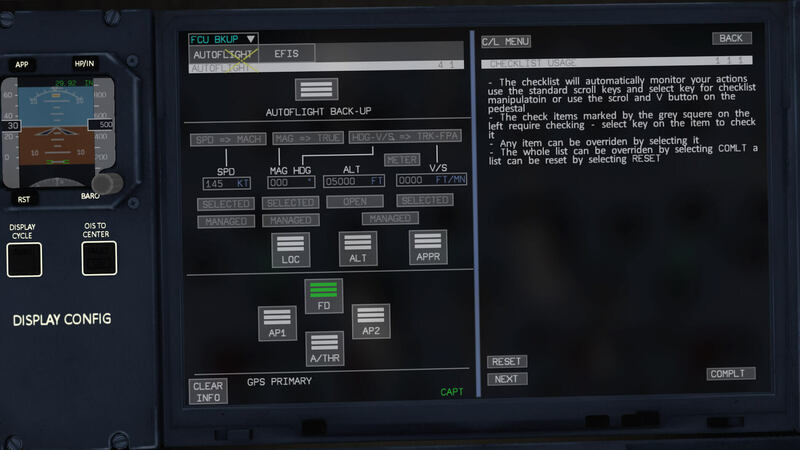 is it really so important that the folding table with keyboard isn’t simulated or that the co-pilots OIS is a static page? All additional features cost CPU power, perhaps also frame rates and in my humble opinion I prefer an as real as possible flying Airbus. Overall I can conclude that many systems are simulated and perhaps I’ve missed a switch or knob that doesn’t have a function or output. Overall I’m happy with what I see, but how about the panels themselves? Do I like them, are they weathered or do you see any scratches and more of that? Remember, while writing this review, the first official A350 to Qatar isn’t even delivered yet, and thus I may assume that the cockpit panels aren’t weathered at all. 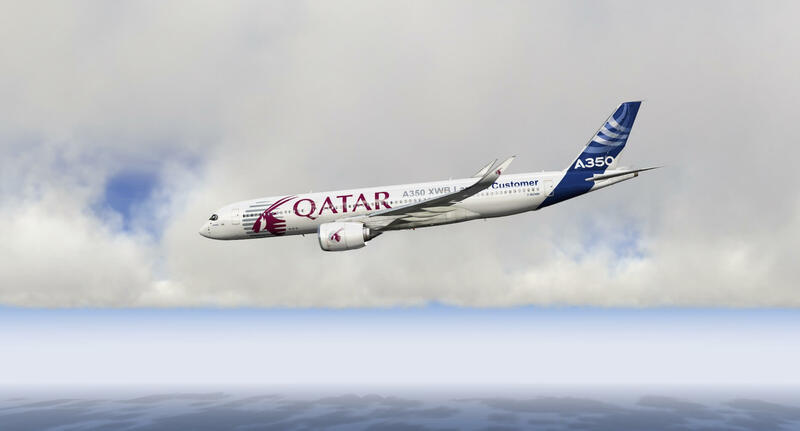 The Airbus liveries included in this package which are the carbon, the standard blue house painting and the mixed Qatar/Airbus livery, they all have flown already for a while around the world. That said, I doubt Airbus Industries or EADS pilots are not being gentle with the flight deck, but normally you should see some “used” spots. That’s something you won’t find, but I can live with that. The only thing that’s difficult to judge is the “blue” color of the cockpit panels. When you check “main.png” file that contains all the panels, they are indeed a kind of grey/blue; however, what I see on my iMac is, depending on my gamma value, blue to grey/blue. The grey/blue I like, but then I’ve set my gamma to 2.6 which is very high and makes external scenery too light. When I reduce my gamma on my Mac to 2.0, the scenery looks nice but then the panels are quite dark. Perhaps this is different on a Windows machine. 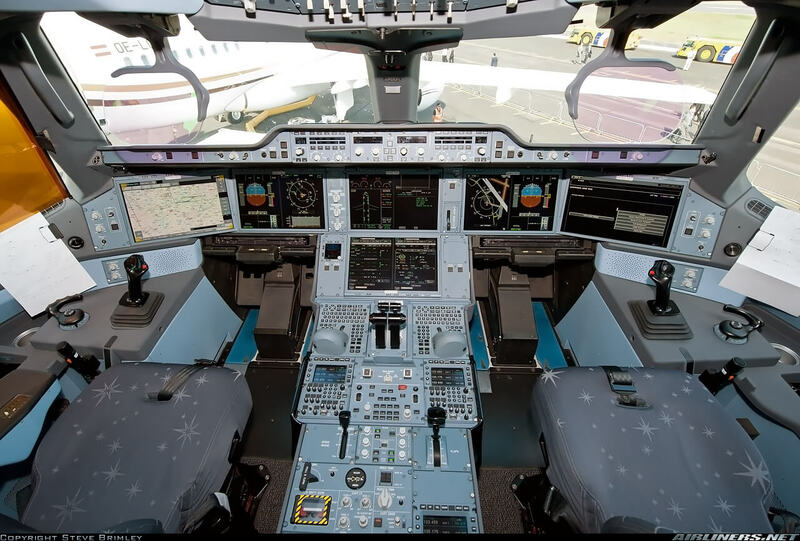 I don’t know that, but checking out real A350 flight deck for their grey or perhaps a mix of grey/light blue tells me that the real Airbus A350 is not as blue as I see on the real photos. Further on, some of the panels have at the edges a kind of weathered look. Some of the grey/blue paint seems to be missing. If this is real, I’m not sure, but hey, it’s something to give it a “used look”. It seems to me that the pilot and observer seat cushion fabric used in the Flight Factor A350 are made of a different kind of “fabric” or I could say, the fabric color and pattern do not match the dark star fabric which can be seen on photos The overall modeling and 3D art work is nice as well as are the knobs, switches, buttons, displays, indicators and much more of this. Even zooming in onto the different DUs (Display Units) or control panels on the pedestal or overhead panel, it stays sharp and panel text is even sharp too. In that respect, I feel confident in the way the panels are modeled. Unless you zoom in a little too close, you’ll notice the number of polygons used for each mounting screen of the individual each sub-panels, but that said, normally you won’t see this at all. I’m very pleased with the EFIS, ECAM, OIS and MFDs. They are very nicely made, sharp, offer the right information and for further background, the available Airbus manuals. All the DU’s have one lighting control rheostat which is mounted underneath the glareshield. The text on the DU, whatever it shows, is perfectly clear, sharp and thus well readable from a distance. The OIS – Options page – MFD control allows you to use the DU’s as touch screen thus via the yellow X and mouse or you can have a popup of the respective DU. The way you control the popup DU is the same as when you use it as a touch screen. I personally prefer the touch screen mode, but I can imagine that you might prefer to have the LH MFD (for your flight plan) being a popup screen. Instead you can always use the old-fashioned FMS MCDU when you feel more comfortable with that one and the MCDU has also a popup function. And yes, this is correct! The floor in the galley is most likely, in real life, covered with a kind of plastic material while the cabin is mostly carpet. Anyway, when you walk to the first class area, I can’t say anything else than everything that can be expected in a cabin is modeled. You can have your doubts about not every part being sharp, but overall the forward section of the cabin is well modeled. 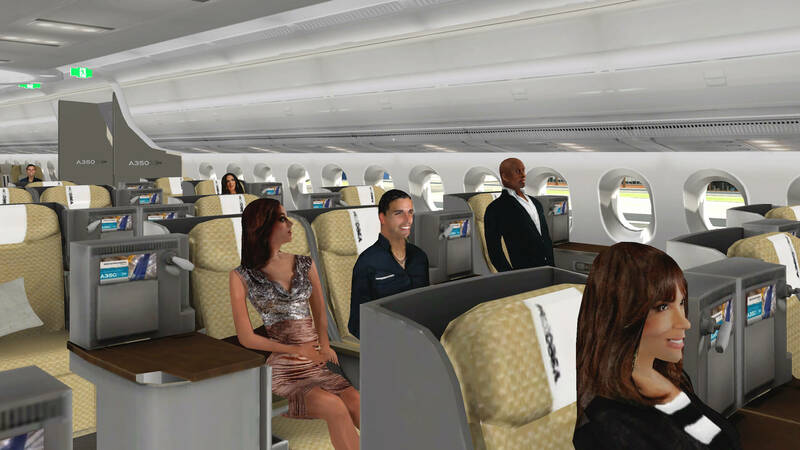 And that not only means the seats, but also the baggage bins, wall panels, ceiling panels, mid ceiling with bins etc. As far as I could see, there’s no further animation included. 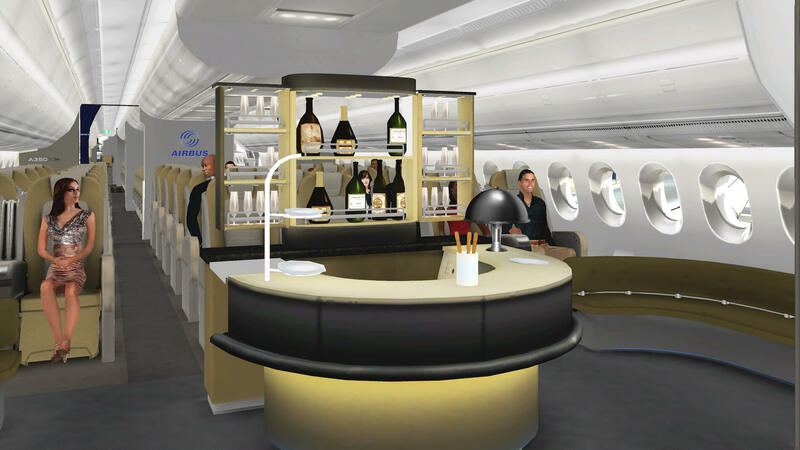 Between the First and Business class, I suppose I’m right, you’ll find in the middle of the cabin a bar and directly behind that the Business class seats. When you walk further backwards, after passing a divider wall, the coach class or Economy class comes into view. As I see it, the seats are again smaller and simpler. Half way down the Economy class you’ll find some lavatories in the middle which are not modeled. Till the far end of the virtual cabin everything is modeled including the large galley or pantry in the back. Let say … it’s modeled with an eye for detail. Not all of the highest quality or with more polygons, no, there’s no need for that. It’s a large aircraft and modeling the virtual cabin too much, meaning many polygons, would unnecessary reduce the frame rates. On the other hand, it’s also fair to mention that when you’re in the 3D cockpit, there’s no unnecessary frame rates impact due to the modeled virtual cabin unless you move to the virtual cabin. I’m also aware that some simmers have no interest in a virtual cabin. They want a top-notch 3D cockpit with, if possible, all systems simulated or nearly all. And yes, when there’s no virtual cabin installed at all, then people will say and even complain … why doesn’t the aircraft has a virtual cabin? Roman tried to keep the frame impact of the virtual cabin as low as possible to preserve most of the frame rates for the flight deck. I think this is, and perhaps many others with me, a good decision. My European test flight first starts with creating a flight plan with the help of the previous mentioned “Online Flight Planner” website. Although the created flight plan doesn’t include a SID and STAR, I can live with that for the moment. 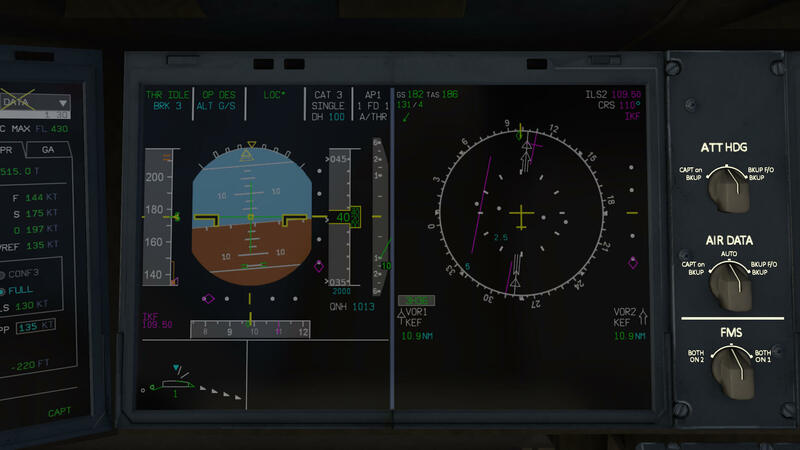 The contents of the flight plan, in X-Plane fms format, can be found below. Feel free to use the contents of this for your first flight. Copy and paste the contents and name the file for example “LFBOBIKF.fms” and copy and paste it into the X-Plane Output/FMS plans folder. I will try not to write a tutorial within this review, since that’s not the intention of a review although I believe some readers would thank me if I included a tutorial. Sorry about that! 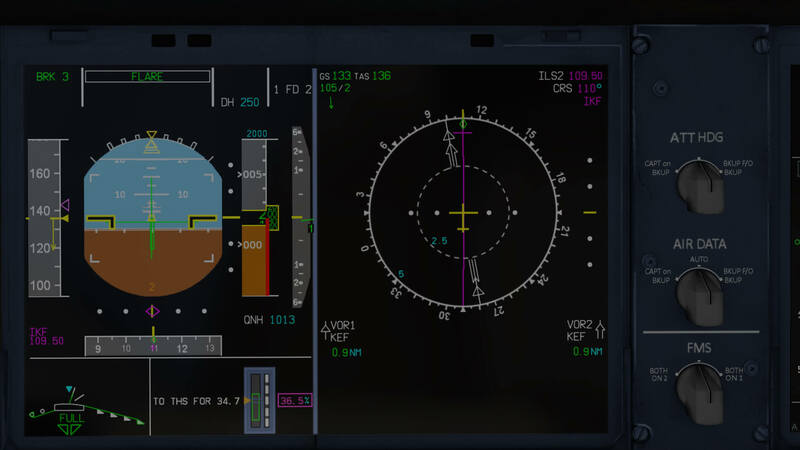 To monitor the flight, many possibilities are available. I choose for the freeware iOS App X-Mapper Lite. It’s a handy app for the iPhone or iPad and it allows you to track your aircraft position on a map, hybrid map or satellite image. More information can be found at the iTune web page. There’s also a Pro version which is worth the investment when you want something more. 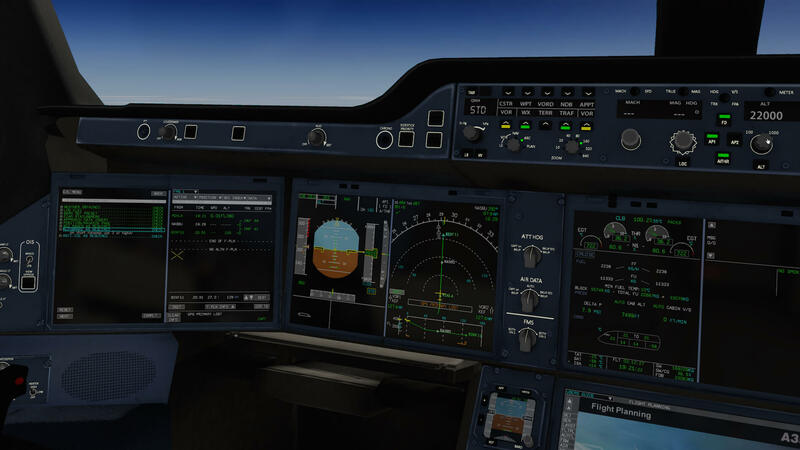 It only cost $ 2.99 US and offers, besides real time X-Plane map tracking,a flight yoke function and a full-equipped avionics panel. Curious about this App? Check it out at the link. Ok, how to make your own onboard charts of the departure and arrival airport? I haven’t seen it in the briefing manual, sorry when it’s there and I missed it, so let’s highlight the steps to follow. 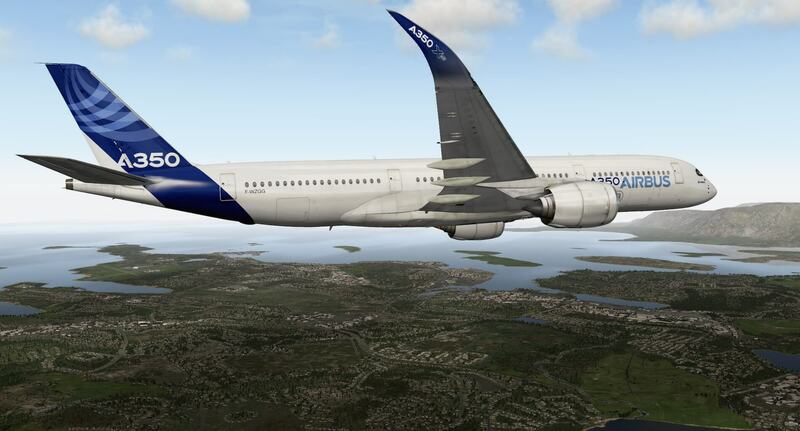 Go to the Flight Factor A350 “Charts” folder. In this folder you’ll see already a couple of folders, namely EBBR, EDDF, LGAV and LZIB. Further on, two Java script files “pdf2png.jar” and “pdf2pngHD.jar”. The Java file with “HD” in it creates higher quality images and that’s the one I prefer. 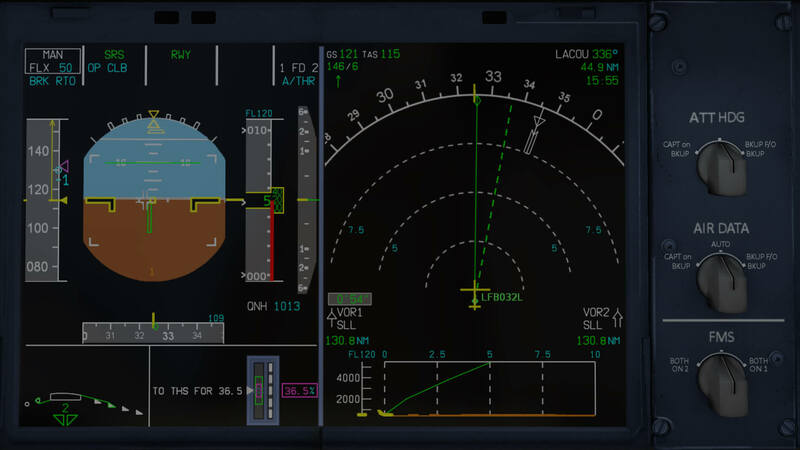 Next I copy and paste the downloaded LFBO Acrobat files into the A350 “Charts folder”. You’re done! When you now look into the OIS Charts section, you will find the newly created LFBO folders including the charts. This was an easy job or not? Oops, almost forgotten for those simmers who would like to have the charts for BIKF. Check out this official AIP Iceland link and follow the same procedure as above to add BIKF also to your A350 Charts map. I started the preparations from a cold and dark Airbus A350-900 with Carbon livery, parked at one of the old LFBO aprons near terminal 1. 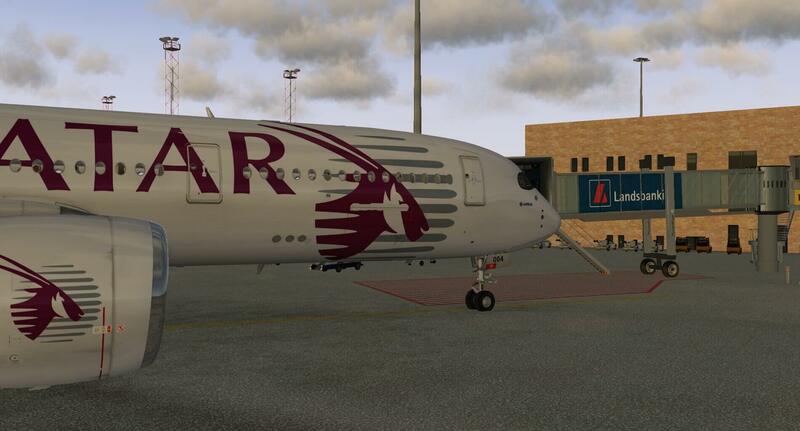 To be exact, I parked the Airbus A350 at apron Alpha A23. I did some cockpit preparations from memory, but quickly looked things up in the electronic checklist too. Before you’re able to use the electronic checklist, you need to select battery switch 1 ON and, either GPU power selected via OIS/Ground Service/Ground Equipment or the APU generator. Just a small tip ….. when you start the APU, and when the APU is up and running, select the APU GEN ON, and the BUS TIE ON (AUTO). That’s enough for the moment to have most of the aircraft systems powered. I calculate roughly the fuel I need for the trip to Reykjavik including the additional fuel needed for an alternate airport, taxi, contingency, APU and remaining fuel upon landing. Via the OIS I insert the number of passengers and the amount of fuel I need. As long as the engines aren’t running, you’ll see some people around the aircraft. 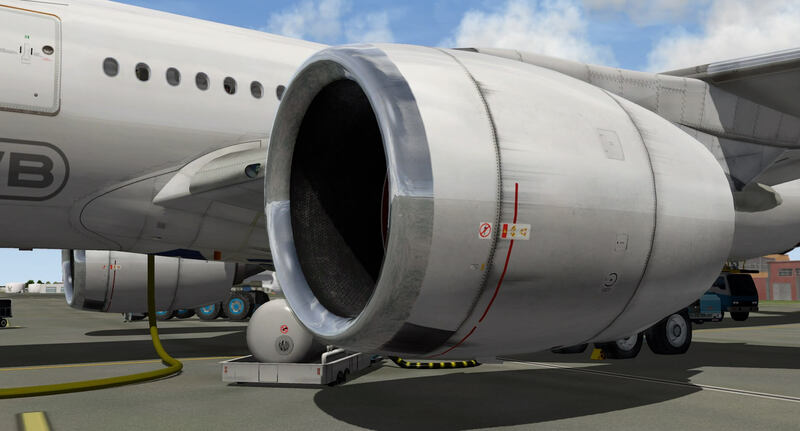 When it comes to the FMS initialization (INIT) and performance (PERF) pages, in the briefing manual there’s a short description of how to handle takeoff speeds and FLEX TO temperatures. More or less the same issue is true of the CI (Cost Index) on the INIT page. That said, I use for my flight a CI of 50. When you want to check all your waypoints, you can use for this the PLAN mode on the EFIS control panel. 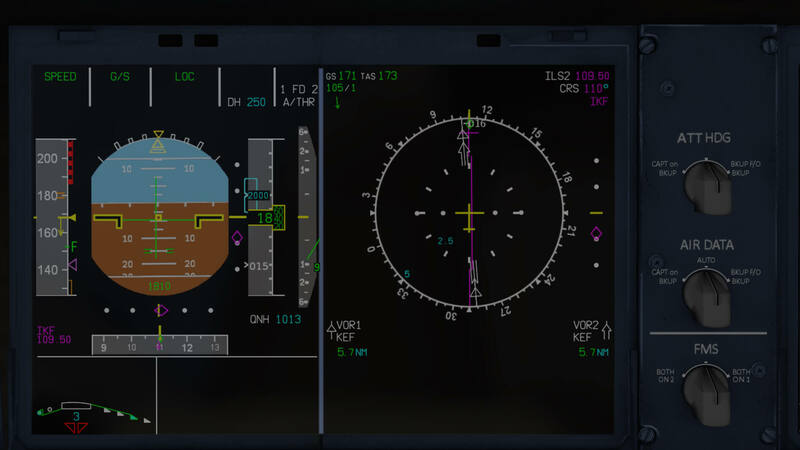 In combination with the flight plan on the MFD or MCDU, you can scroll thru the flight plan in combination with the ND. 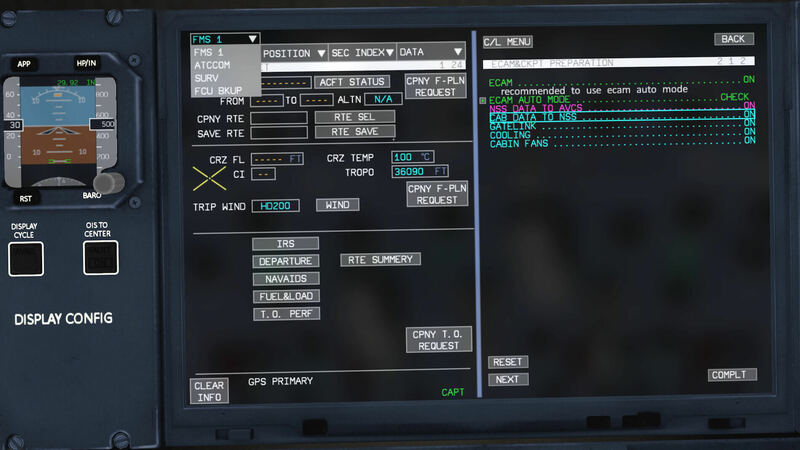 But you need to keep in mind that scrolling thru the MFD flight plan is linked to the captain’s ND and EFIS PLAN mode. Doing this on the MCDU, you need to use the co-pilot’s EFIS control panel ND PLAN mode with the co-pilot’s ND. Via the checklist I’ve reached the point where I can start my engines. When you’re not familiar with how to do this, read once more the briefing manual via the Acrobat file or just, and much easier, via the left hand OIS. Then read the steps in the electronic checklist and you’ll find out that it’s really very easy and this is not because you’re dealing with a simulated model. This is as real as is gets except for the many malfunctions that can appear during a real engine start. Although I have to admit that today’s FADEC (Full Authority Digital Engine Control) is clever enough to detect any malfunction, sometimes before a pilot notices anything the FADEC takes immediate corrective actions and via ECAM the pilots are informed what to do. By the way, manual engine start with the help of the guarded MAN START switches on the overhead panel isn’t implemented. Basically an A350 XWB engine start is no more then placing the ENG START selector to IGN START and position the ENG 2 switch to ON. The rest is controlled and monitored by the simulated FADEC. As simple is that …. as real as it gets! Hold on …. some steps are needed in advance. Of course, to start the engines you need bleed air for the engine starter. 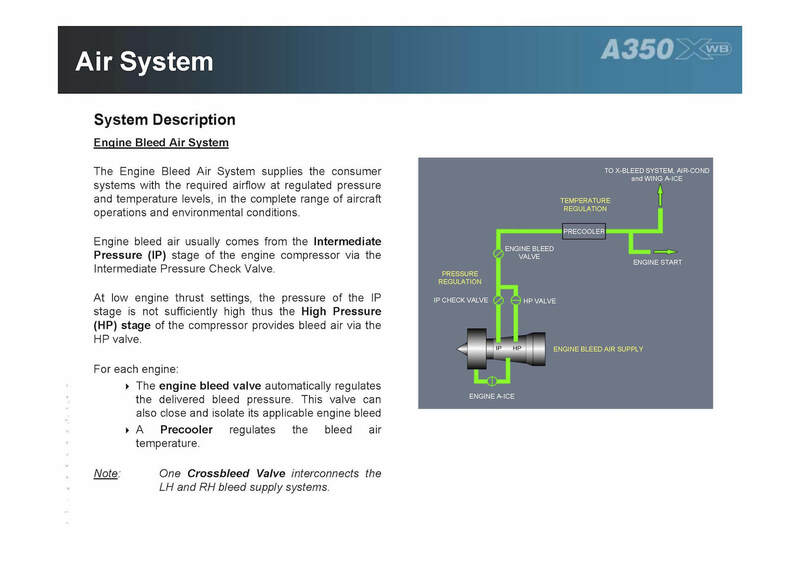 That said, you need either APU BLEED AIR thus the APU should be running or you use external high-pressure bleed air. The latter can be selected from the OIS Ground Services – Ground Equipment – High Pressure Unit. Tick CONNECT and ENGAGE. However, the external high-pressure unit is connected to the left and bleed system and thus only available to the left hand engine starter. Therefore, you need to select the BLEED X valve (CLOSE-AUTO-OPEN) to OPEN. Next select the ENG START selector (CRANK-NORM-IGN START) to IG START position. Due to this action, the ECAM ENGINE synoptic appears on the display. Then it’s just where I started with, select the ENGINE 2 switch to ON and monitor the engine parameters. Since it’s all controlled by FADEC, any problems that could appear are monitor by FADEC and if needed, the engine is shutdown. No, you won’t have any problems, believe me! Taxiing to runway 32L is not far, but long enough to get a good idea about the taxi characteristics of the modeled A350. The modeled A350 follows my NWS (Nose Wheel Steering) commands as expected. But just a tip … try to keep your taxi speed low especially when making turns else during turns the aircraft will not follow the intended taxi route. Sitting in the flight deck during taxi is nice and realistic, but please, use also keyboard combination “Shift + 4” and see how the wing flex is implemented when, for example, you stop the aircraft using your brakes. Due to the implemented FBW plugin from QPAC, it flies like a charm and although I have no real Airbus FBW flight experience, it feels very good. That said, you can decide to fly the A350 by hand for a while and thus you leave the Auto Pilot disconnected. Why not? In my years with Martinair Holland on the Airbus A310 as ground engineer we had several pilots who flew the Airbus up to around 10.000 feet altitude by hand – of course, they trimmed the aircraft, but no AP was connected. In those days and with this aircraft, the pilot could trim for pitch via trim switches on the control wheel. When you think you have done enough flying the A350 by hand, you can always decide to connect AP1 or AP2. The moment I’ve connected the AP, I have a little more time for myself, and I can take a cup of coffee or tea, but above all, I can test and check my instruments and systems behavior. I can play around with the ECAM control panel and see the status of each aircraft system which are, by the way, real time. 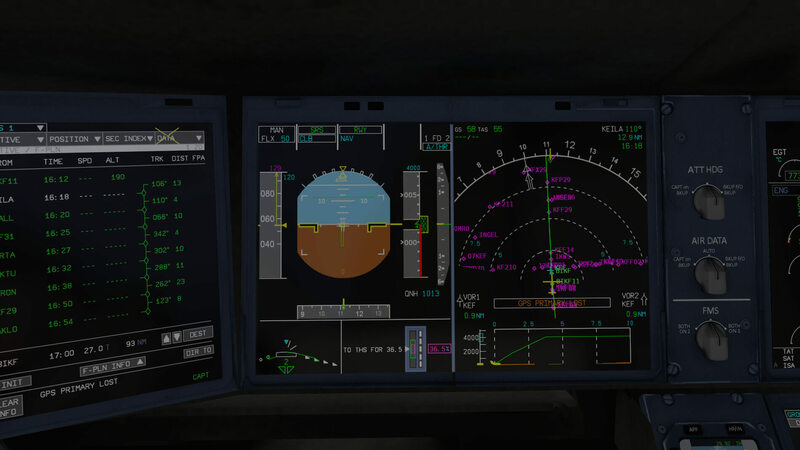 With the A350 climbing to FL330, it’s time for me to check out the ECAM system and play around with the OIS and MFD. The charts function of the OIS is very good, however keep in mind that the overall resolution of the charts isn’t always such that you can read what’s shown. Using the different functions and tabs of the MFD is nice, but remember that not all functions are functional. One good example is adding a HOLDING. I mentioned before that you can’t add a SID or STAR to your flight plan since the modeled FMS uses the default FMS files. 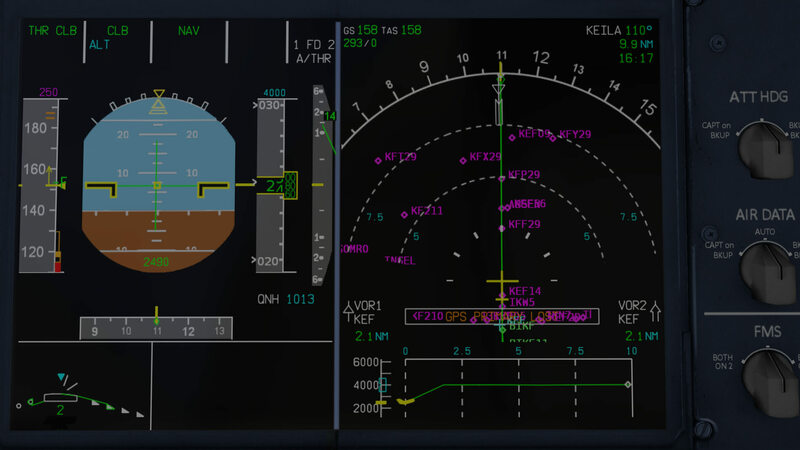 To automatically add a SID and/or STAR, you need either the Navigraph or Aerosoft NavDataPro AIRAC. But you can create your own SID and STAR with the help of the respective SID/STAR chart, add this into the MFD or MCDU flight plan and save it for later. If you want, you can even try, while at cruise with a perfectly trimmed aircraft, to disconnect the AP and fly it again by hand. 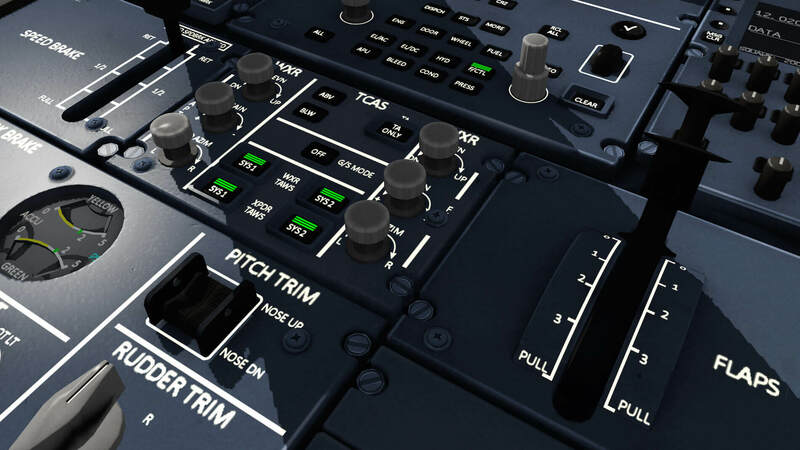 You can but it’s far from realistic, assign the PITCH TRIM channel to your joystick via XP menu “Joystick & Equipment” sim/flight_controls/pitch_trim_down and sim/flight_controls/pitch_trim_up. I write on purpose “far from realistic” since the Airbus sidestick doesn’t have trim switches. 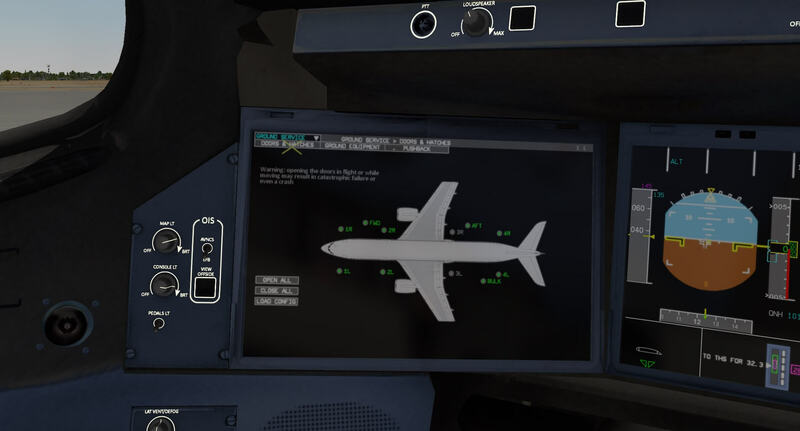 In the real Airbus and modeled Flight Factor A350 with QPAC FBW plugin, when you move the sidestick (joystick), you actually command a load factor. 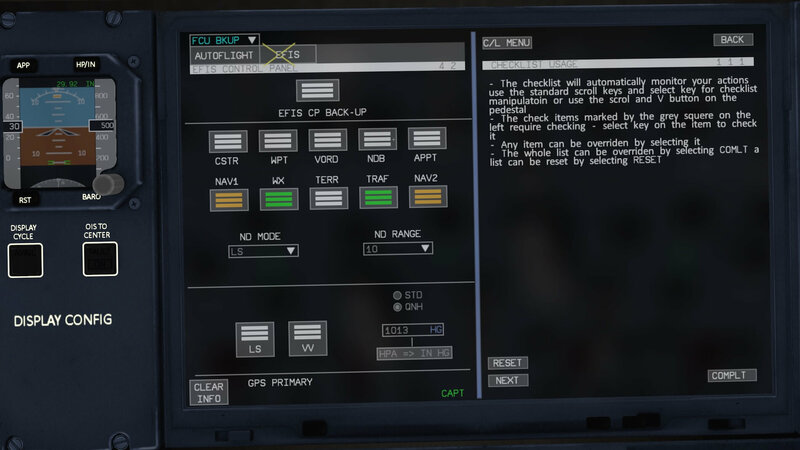 The computers then execute that command and they provide an output to the flight controls. That said, when you want to fly as real as it gets, then don’t assign for Flight Factor A350 any trim to the your joystick. Further more, ROLL trim doesn’t exist in the A350, so there’s no need to assign this to your hardware. Another thing you have to keep in mind is the absence of the TOC (Top Of Climb) and TOD (Top Of Descent) arrow on your ND (Navigation Display). This means that you need to calculate the TOD yourself. Although not yet relevant, for a quick and dirty formula use the 3:1 formula – that if you’re at 30.000 feet, you need to start your TOD no later than 100 NM out of the arrival airport (Source airliners.Net) or have a look to this link. 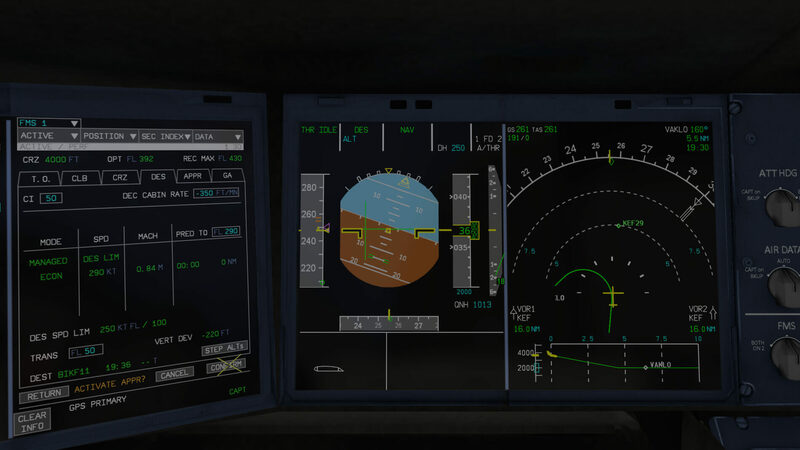 It’s not my intention to write down every possibility you have with the touchscreen left hand MFD, but you can play with it during your flight and see how a properly “touchscreen” it is. You can, indeed should, use it as a replacement equipment for the old-fashioned FMS MCD. The left hand MFD can show you a little more than only a flight plan including all related FMS pages. The MFD can also show you ATCCOM, SURV and FCU BKUP pages. 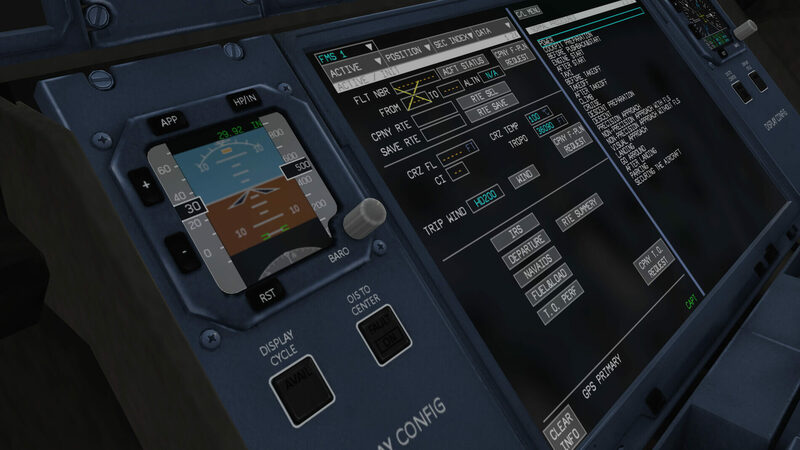 When you select ATCCOM, you’ll notice that many other tabs are available of which some aren’t functional. I tried to do a couple of things, but I’ve got the idea that this isn’t yet fully functional. 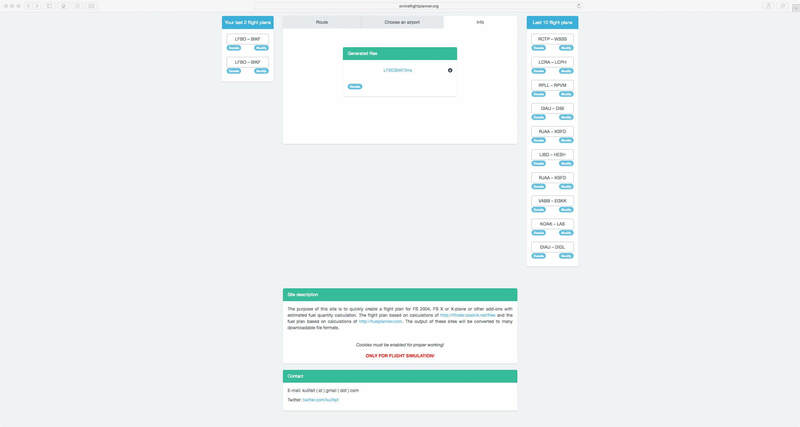 The SURV page has two tabs of which both are fully functional and actually replace, in case it is needed, the ordinary control panels on the pedestal. 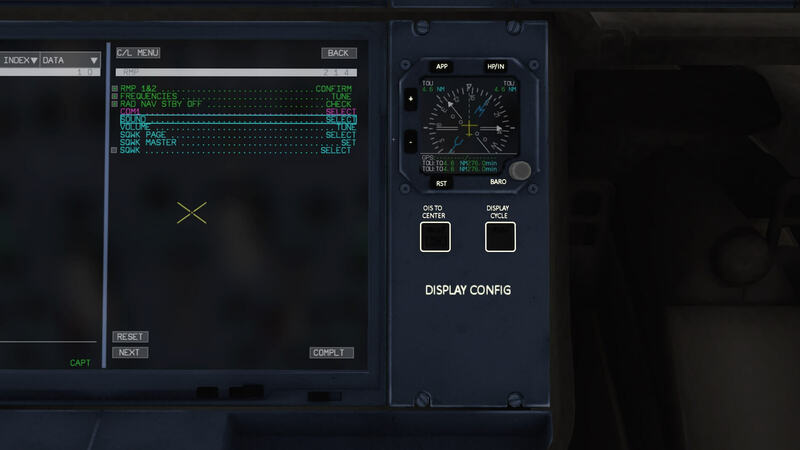 When you do your cockpit preparations, you can select for example on the pedestal the weather radar panel, the ATC transponder panel and others, or you simple use this SURV option on the MFD. In my humble opinion selecting the systems ON or setting values via the MFD is much quicker and you’ve got a better overview what to do. 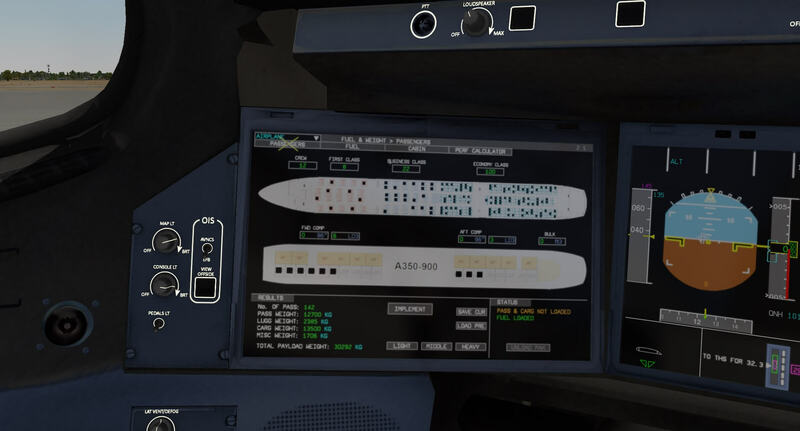 Although we call it touchscreen, then perhaps not the right word since you can’t control it with your fingers, but the fact that you can use your mouse and the yellow X to control on-screen settings is very handy and close to the real A350 touchscreen. The FCU (Flight Control Unit) BKUP MFD page is really worth a try, but when you try, keep on monitoring your EFIS displays to see that what you change on the MFD is actually shown on the EFIS displays. The FCU BKUP has two tabs; AUTOFLIGHT and EFIS. Let me start with a simple example. 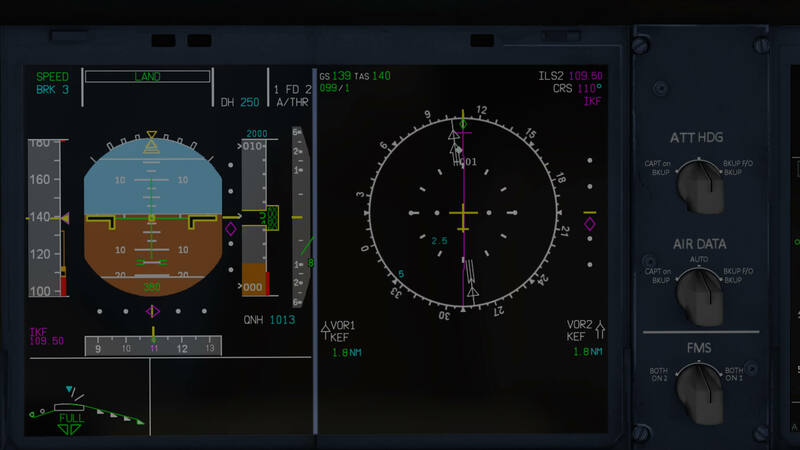 Let us select the EFIS tab on the MFD and try the VORD button. When I click it, the VORD button stays white and I don’t see any change. Oops, that’s right … it’s a backup function. That said, you can’t have two captains on one ship, right? This means that I first need to activate the backup function before I can do anything. Click the EFIS CP BACK-UP once and the button turns green. I’ve now activated the backup functions. When I now click the VORD button on the MFD, the button turns green which means it’s active and the output can be seen on the “hardware” EFIS control panel and of course on the ND provided you have the NDS mode selector in NAV or ARC. Funny isn’t it? Now up to you to try out the MFD AUTOFLIGHT backup. Another thing that’s worth telling you is the independent control and visualization of for example the ND displays. Indications on the co-pilots ND are not a replica of what you see and adjust on the captain’s ND. They work completely independently. That said, the captain’s ND can show an ARC with 20NM range and VORD button selected with VOR1 and ADF1 active while the co-pilot’s ND can show totally different things. 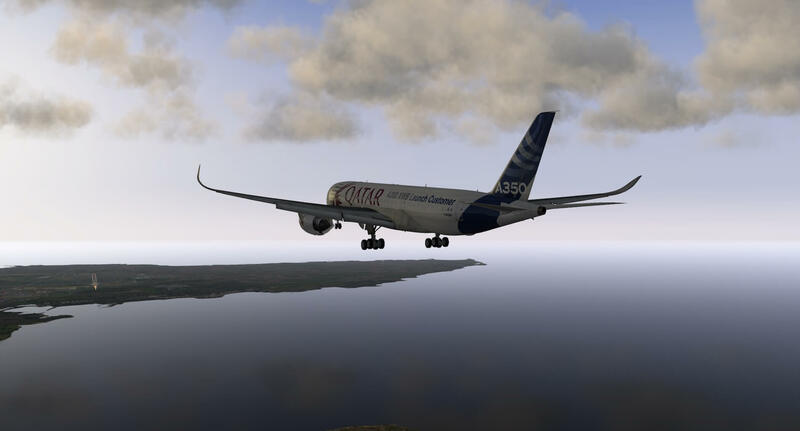 Give it a try when you have the Flight Factor A350. Although the PFD indications look the same on the captain’s and co-pilot’s displays, small differences are possible too, such as the BARO setting or STD indication. Even these are not master-slave indications! The same is true for the LS (ILS) and VV (Velocity Vector) pushbuttons. When you’ve pressed the captain’s LS and/or VV, there’s no LS or VV indication on the co-pilot’s PFD. Again, separate systems and separate indications! Since the trip to Reykjavik isn’t a one-hour flight, it’s perhaps also an idea to check out the onboard user manual, or you can do already some descent preparations before. 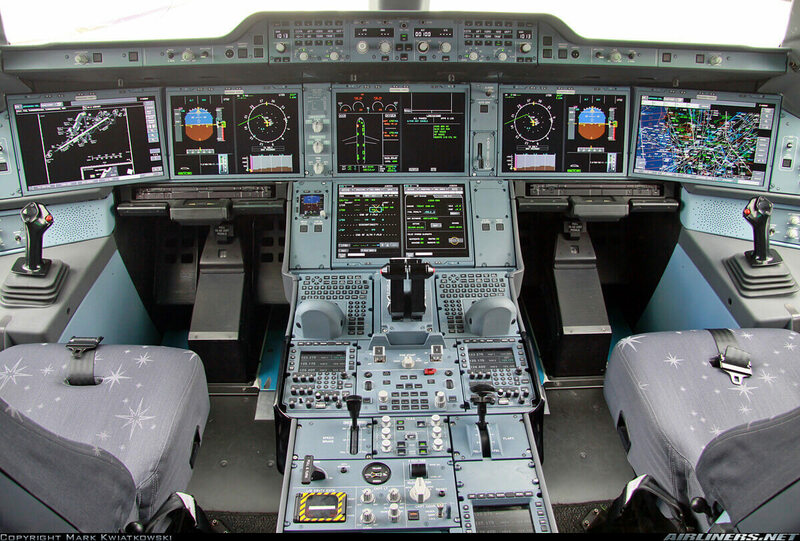 There’s a lot to see and to try in the modeled A350 flight deck. Enjoy! 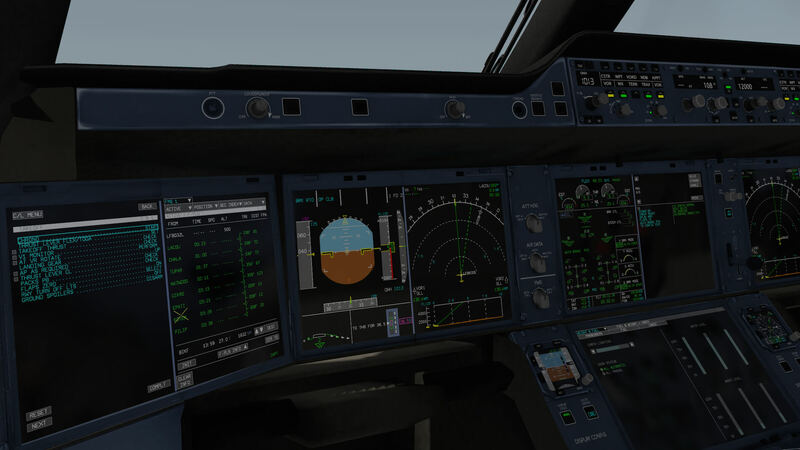 When you’re familiar with modern Airbus aircraft for X-Plane, you know that before you reach TOD, you enter already the new assigned altitude for your descent or when there’s no ATC, you assign a new descent altitude you want to go to. 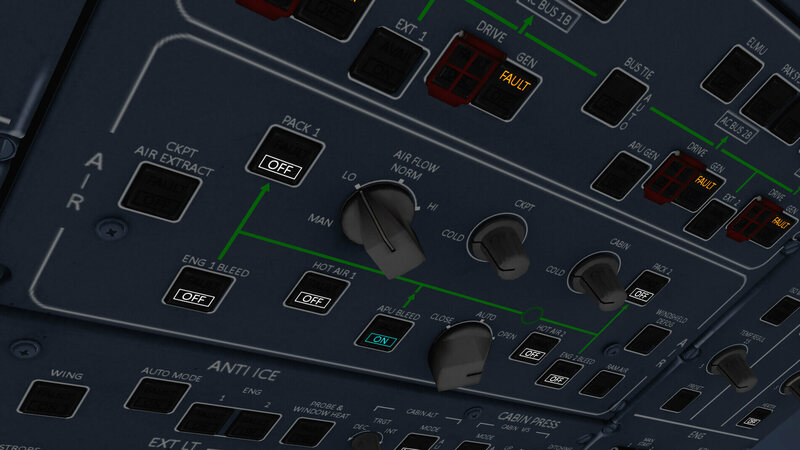 Just enter the new altitude via the ALT knob on the AFS (Auto Flight System) panel, and the moment you’re at or nearby TOD, you click the ALT knob and the aircraft starts with the descent. The only thing you need to do is nothing …. ok, perhaps when needed, you need to give some speedbrake, but when speedbrake or drag is needed, you’re informed of this via a green message on the PFD. You can, no, you must leave your fingers off from the TLs (Thrust Levers). It’s all done and calculated by computers. This means that the engines go back to IDLE power although the TLA stays the same. They stay physically at the same position. 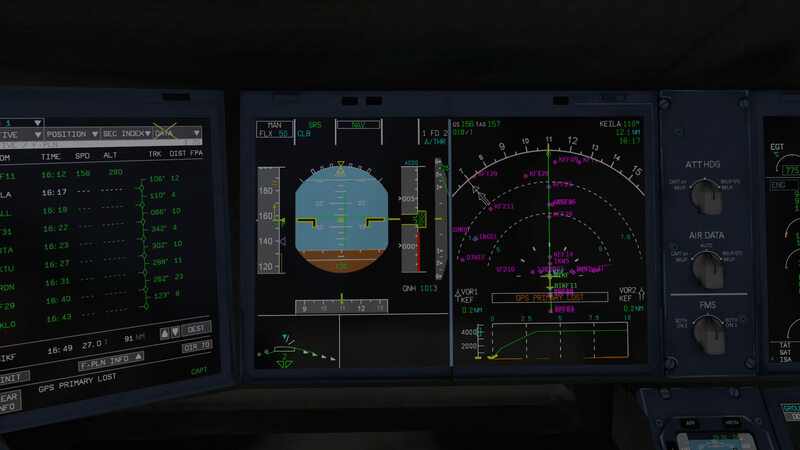 Of course, if you want, you can play around with the aircraft descent. You can select a certain vertical speed if you want, but then you’re no longer in the Managed mode. But once the lower altitude is reached, the Auto Flight system reverts back to the Managed mode. This can be seen on the PFD FMA (Flight Mode Annunciator) and when you don’t feel comfortable with this, then you click once more the ALT knob and the Auto Flight systems levels off at that altitude and goes back to the Managed mode. It’s all so easy and typically Airbus! When I’ve reach the airport at around 50NM, I leave the flight plan as it is, click the HDG knob, and follow my own heading that should lead me to runway 11. 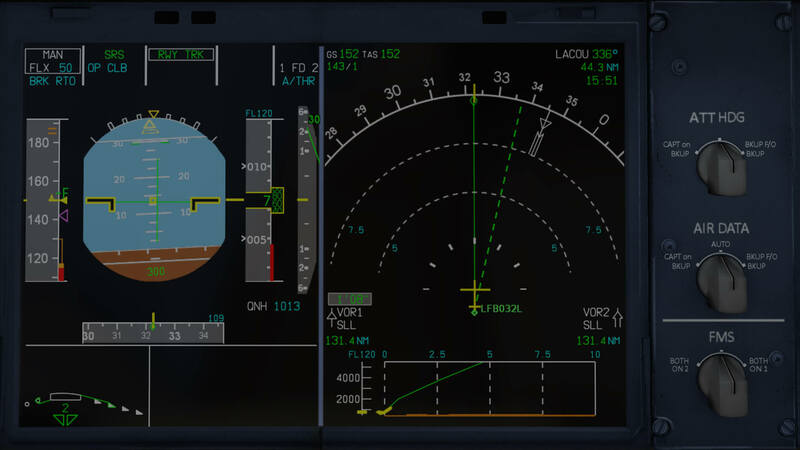 Normally, when there’s ATC, ATC will tell you which heading to follow and even which altitude to descend to. You will notice on the ND that the current HDG you’re flying is not a straight green line while the intended flight plan is now green dotted. Handy in case you lose the way, the last waypoint in my flight plan was BIKF11, representing runway 11. In other words, this last waypoint is always a good “visual ND” reference. If you want to, you can also decide to disconnect the AP and fly the aircraft towards the runway by hand. I decide to leave the AP connected, descend to 4000 feet and turn my heading to 320. It’s not a straight in approach, but I have to keep out of the hills. To keep my speed under the control of Auto Thrust, I activate on either the MFD or MCDU the APPROACH mode. This will first reduce the airspeed to the green dot speed, and after that with every slat/flap selection, it will reduce the speed accordingly. In other words, no worries about the aircraft speed! Once I’ve turned into the bay, north east of the airport, I disconnect the AP, press the APPR button on the glareshield and luckily for me, a LOC* appears in the PFD FMA. The only thing I need to do right now is just focus on the PFD and the ND, which I switched to ILS ROSE mode. Although I’ve selected a 10NM visibility, I can see the runway including the PAPI lights left of it. Termination can be done in many ways, but the most elegant way is following the checklist and connecting the external power to the aircraft. It won’t take much time and it’s more fun then just shutting down X-Plane. If you don’t want to make such a long flight from mid-southern France to Keflavik, you can also decide to fly from Dublin (EIDW) to Keflavik (BIKF). For both airports there are very nice, detailed and accurate payware packages available. 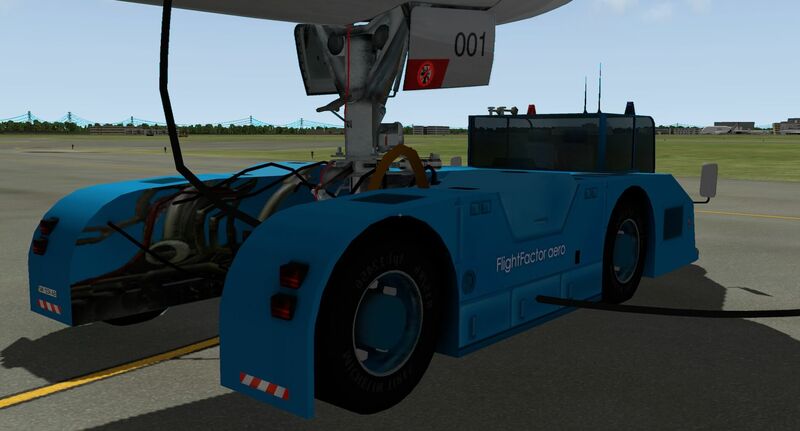 First, the Aerosoft airport scenery of Dublin International Airport. 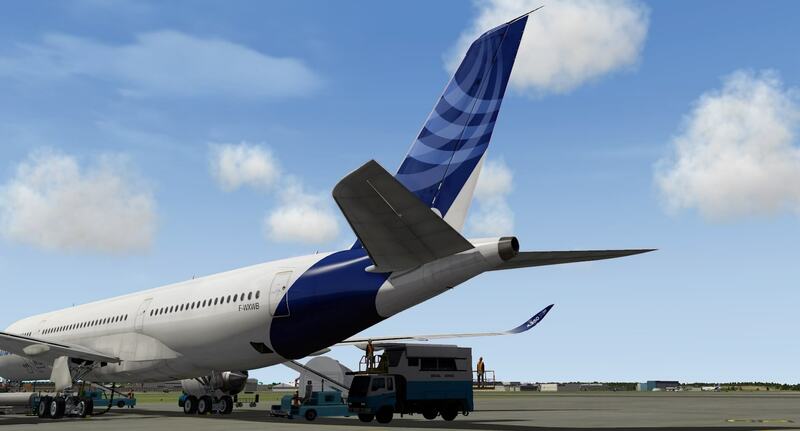 Second, Keflavik International Airport is also available from Aerosoft via this link. And for those who prefer to fly a shorter flight, here’s the “fms” flight plan from EIDW to BIKF. Create a text file, copy and paste the italic content in this file and name it EIDWBIKF.fms. You could of course leave it as it is and end in a normal way your flight to Keflavik, but when you like it, I encourage you to do the following practice. It’s a flight from BIKF to BIKF, so nothing special. 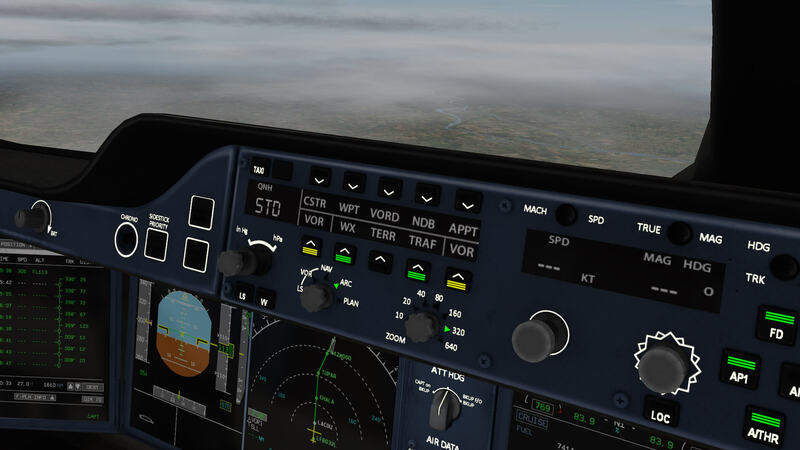 See it as a training flight where you try to fly manually from waypoint to waypoint, only looking on your EFIS displays. You could of course set the visibility to CAT I, II or III, but that’s entirely up to you. 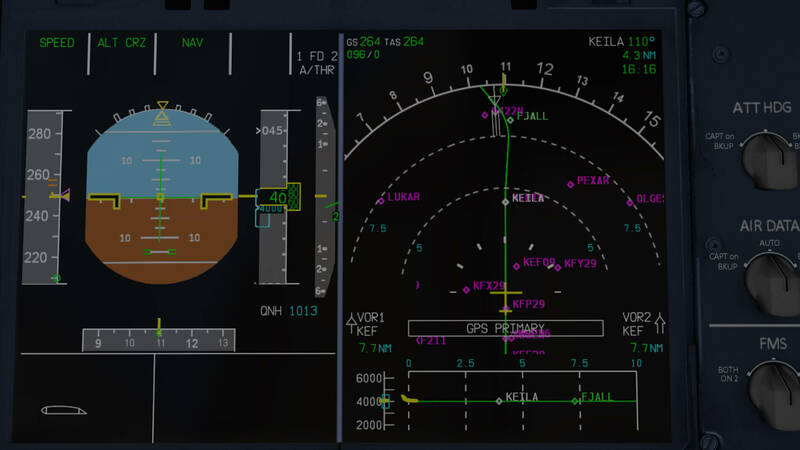 The training flight starts from runway 11, and follows the following waypoints: KEILA – FJALL – RKF31 – MURTA – REKTU – OTRON – KEF29 – VAKLO and finally try to make an ILS landing back at runway 11. Climb out to 4000 feet and stay at this altitude. When you pass waypoint OTRON, descent to 2000 feet. Don’t worry about Auto Thrust. 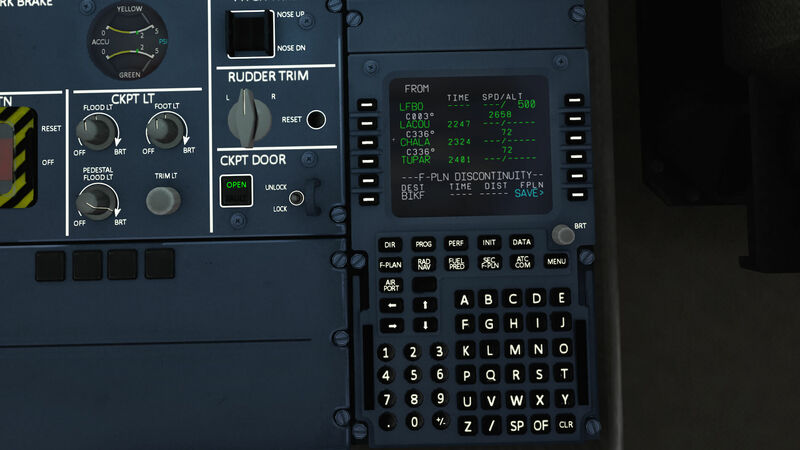 Enter these waypoints in your MCDU or MFD and enter the performance values too. When you’ve done all of this, takeoff from runway 11. Ok, you’re allowed to connect the AP for flying to the first waypoint, but then disconnect the AP and try with small corrections to follow the flight plan on the ND and keep the aircraft at an altitude of 4000 feet. Believe me, you’ll be surprised at your skills. The A350 seems a very easy aircraft to fly by hand. How real is it? No idea since I never flew an A350 myself, but what I’ve heard from FBW Airbus pilots, it does fly very easily. Ok, here’s a suggestion … climb out to 4000 feet and stay at this altitude. If you want, you can also climb to 6000 feet. In that case, don’t forget to set a higher altitude at the AFS panel. Keeping in mind the surrounding area, you won’t pass any hills or mountains when you cruise at 4000 feet. When you approach waypoint KEF29 at 5NM, descent to 2000 feet. 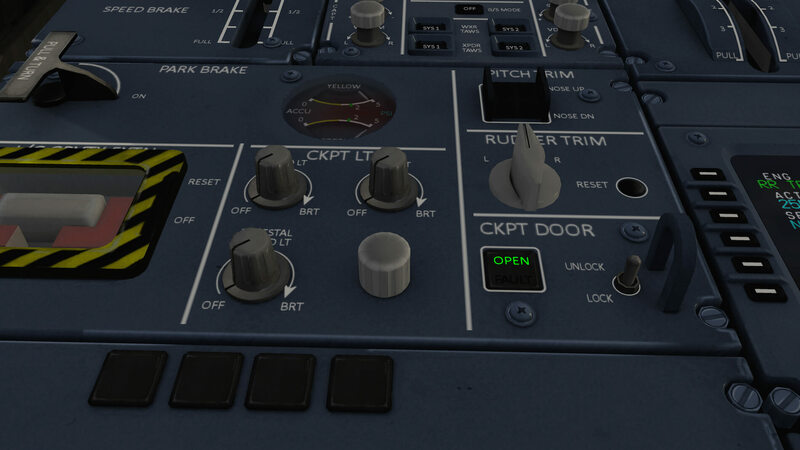 To have the FD (Flight Director) helping you, select the ALT knob previously already to 2000 feet and then pull the ALT button (DES) or push the ALT knob (OP DES). Also check on the MFD or MCDU if you’ve selected for your planned landing runway 11 BIKF. 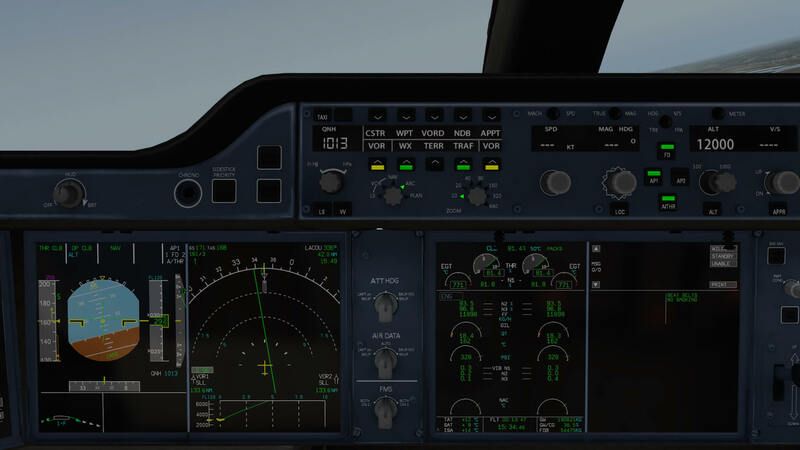 How to do this on the MFD? Stay with the yellow X in the flight plan on BIKF, click it once and select from the grey popup list “ARRIVAL”. Select from the left hand dropdown list named “RWY 11 ILS”. Frame rates, frame rates and even more frame rates. We all want to have 50 and some even higher. But is it really needed to have such high frame rates since our eyes can’t detect any faster then, lets say 30 FPS (Frames Per Second). Some say that we can’t spot any faster then 25 FPS, others say 35 FPS. Ok, so how many frame rates do I get with the Flight Factor A350? No no, that’s not so easy to answer. Your actual frame rates depend on so many things like for instance your Windows, Linux or Mac computer. Besides that, how much VRAM does it have, thus what’s the graphical adapter’s amount of memory and, not unimportantly, your PC or Mac CPU. Oops, and also, when it comes to hardware, the monitor resolution. In other words; the higher your monitor resolution is – with X-Plane running in full screen mode – the lower frame rates you will have. Not necessarily too low FPS, but just less than when having a lower screen resolution. The amount of system memory is also an interesting item, but doesn’t really influence the frame rates, but the more system memory you have, the better it is, but that’s not something new. And, unless I’ve forgotten something, your X-Plane Rendering Settings are very important and could, indeed will, influence the frame rates too. And remember, it’s not always needed to set every option in the Rendering Settings to ‘high’. Try to find a balance! And finally, what can influence your frame rates more? 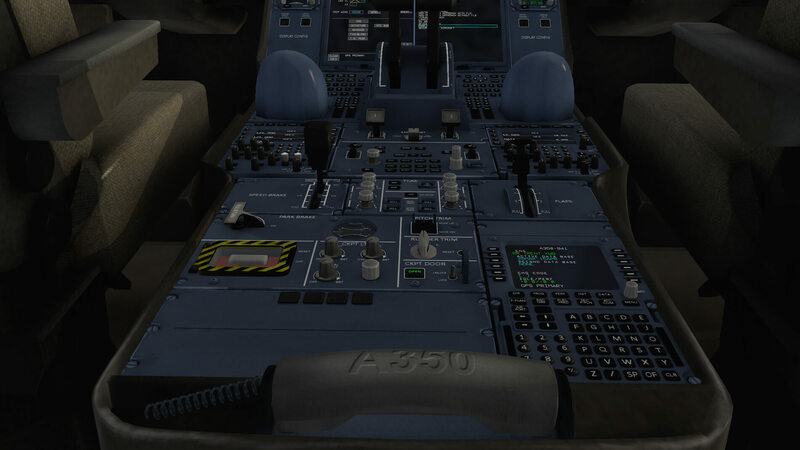 The complexity of the aircraft which is certainly also applicable to the Flight Factor A350. But the weather could be an issue too or the installed airport scenery, and what about if you’re in the flight deck or hovering around the aircraft? All kinds of issues will influence the frame rates. I can tell you that with the aircraft still at FL330, some clouds below me, sitting on the captain’s seat in 3D cockpit mode, I have roughly 25-30FPS. Low? Not really knowing my XP Rendering Options (see below). When I hover outside the aircraft, the FPS moves up, not strange, to 50-80 FPS depending on the angle I’m looking at the aircraft and the environmental conditions. By the way, all these figures are based on daylight conditions. Upon approaching BIKF with default X-Plane scenery around me, the frame rates drop to 20-25 FPS. 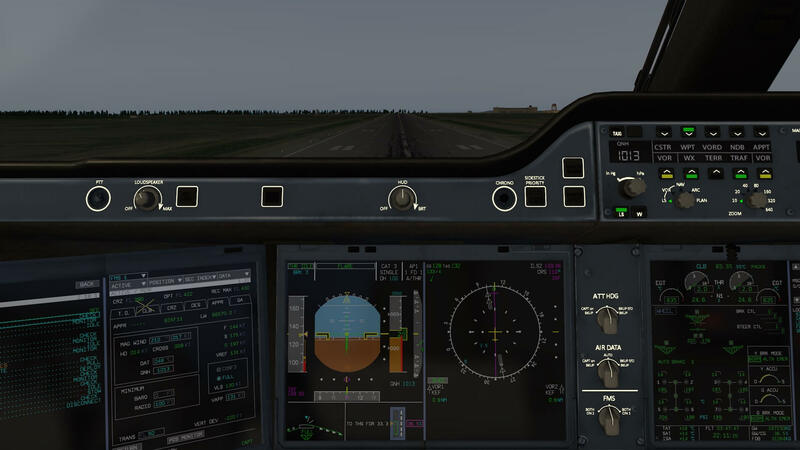 After landing and taxiing to the apron, is goes to the safe value of 19.9 FPS, but I tell you that’s also because of the high settings in my Rendering Options. Yes, I am. I’m aware that my X-Plane settings are high, perhaps higher then needed, but I want to see things around and below me as real as possible. With such a review, is it then needed to add a summary right here? Perhaps it is, since a summary should help those who don’t want to read the whole review. That said, let me try to write down a couple of things. 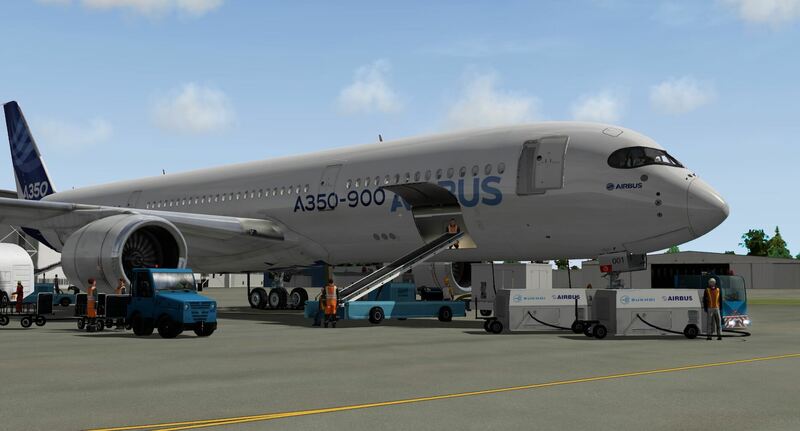 The modeled Flight Factor A350 is the Airbus A350-900 series. 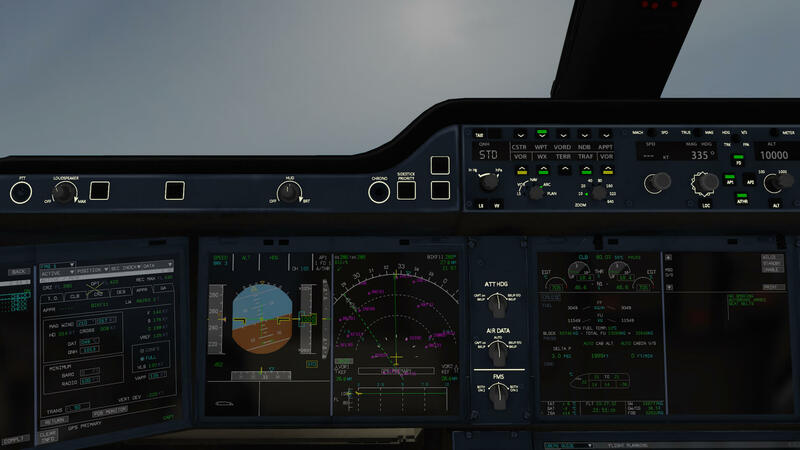 The Advanced model comes with a lot of features and although the FMS isn’t fully functional and no Navigraph or NavDataPro AIRAC DB is used, it still offers a lot of possibilities to make every flight a success. 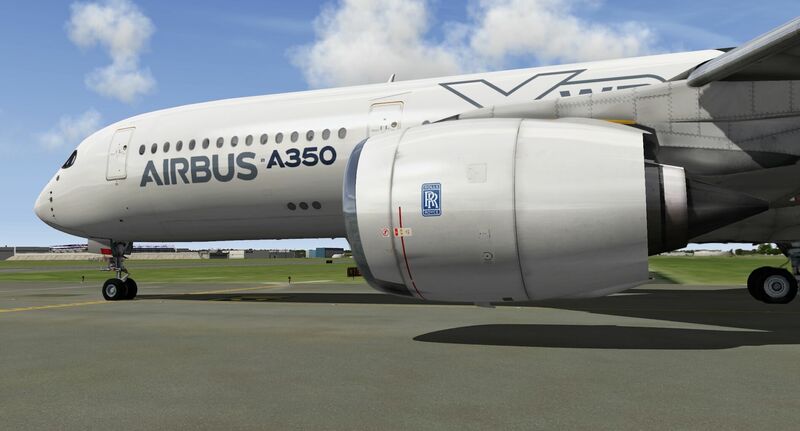 The external 3D model represents without doubt a great replica of the real Airbus A350 especially with the glossy realistic look. The base package comes with 7 liveries of which 3 are real. There’s also a paintkit included for those who have painting skills and others who have “livery” wishes. 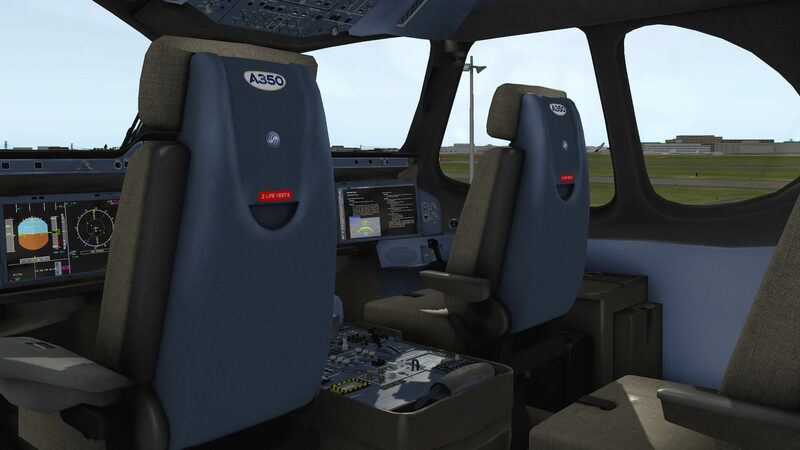 The aircraft comes not only with a detailed 3D cockpit, but also with a virtual cabin. 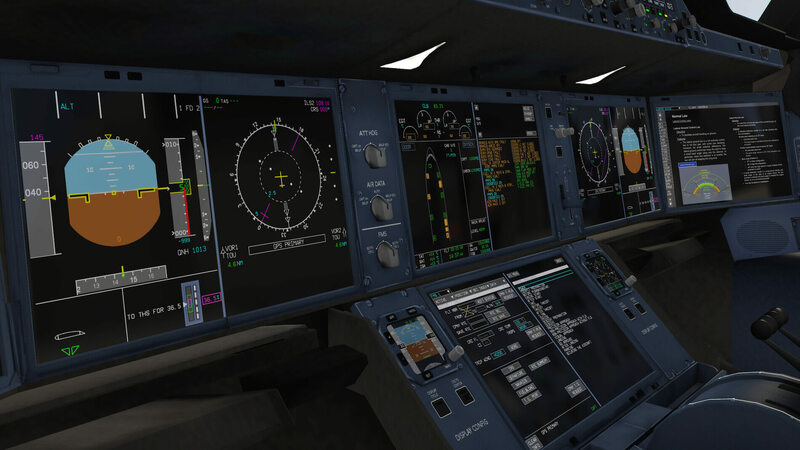 Although the heart of the modeling goes to the flight deck, the virtual cabin does look attractive. 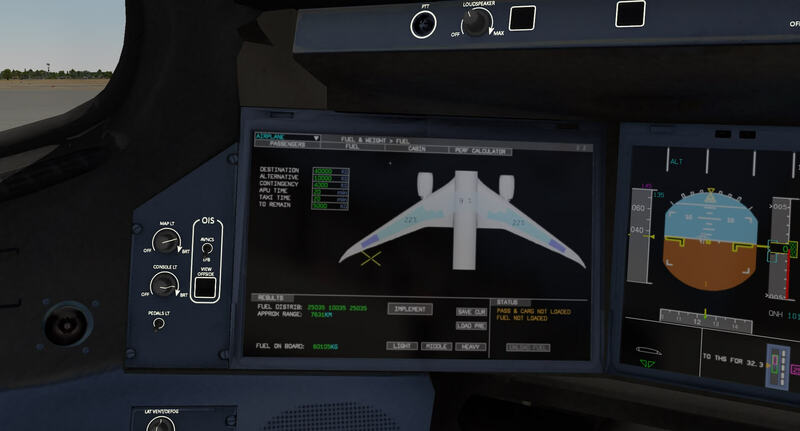 Flying the modeled Airbus A350 seems not very difficult, but as I’ve heard from real Airbus pilots, FBW (Fly-by-Wire) controlled aircraft with of course the sidestick in place, are not complicated to fly. 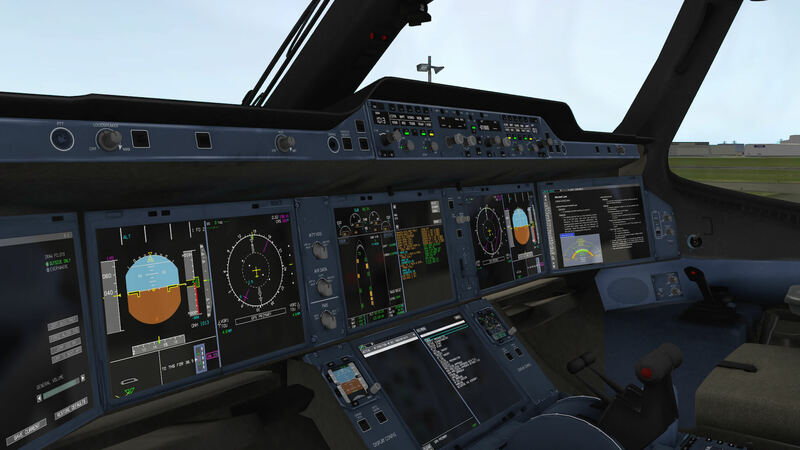 That said, you need to practice flying the A350 by hand, but a good joystick, for example the Saitek X52 Pro or the X55 Rhino, will make manual flying a success. Using the touchscreen OIS and MFD is fun and gives you really the feeling you’re inside the A350. And no, the Advanced A350 doesn’t come with a taxi camera, perhaps later since this is a very nice real and simulated feature. But other camera features aren’t implemented. 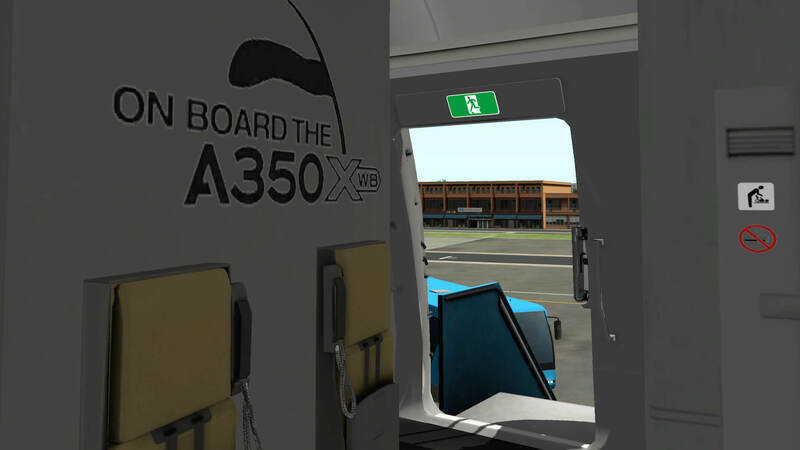 I mentioned this briefly before; the A350 has the realistic FBW plugin implemented provided by QPAC. 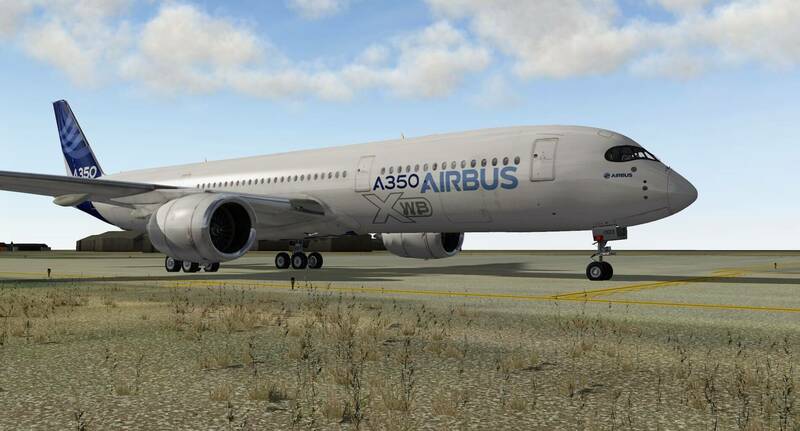 Do I know if the modeled A350 flies as real as it gets? 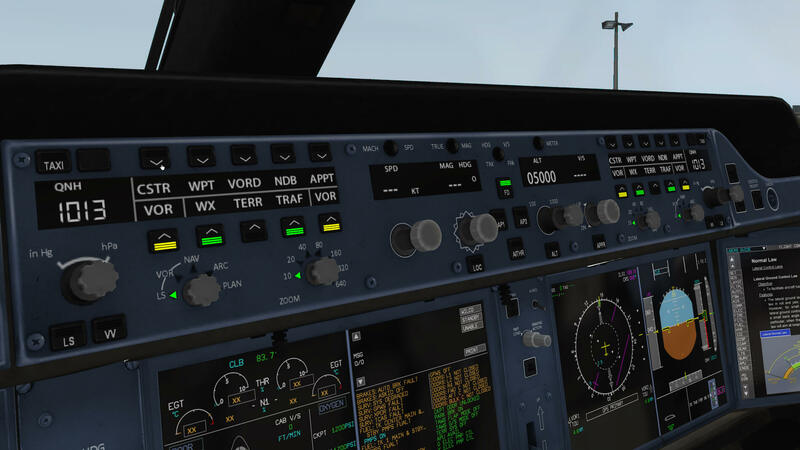 No idea since I’m not an licensed A350-900 pilot, but we all know that the QPAC FBW plugin has a great reputation since this plugin is based on real Level-D simulator data. Some people can confirm this nearly flawless FBW behavior since they had the opportunity to fly an A320 Level-D FFS (Full Flight Simulator) at the Lufthansa Flight Training Center in Frankfurt. There’s a lot to learn about the FlightFactor aero A350, and there’s a lot to check out while flying. 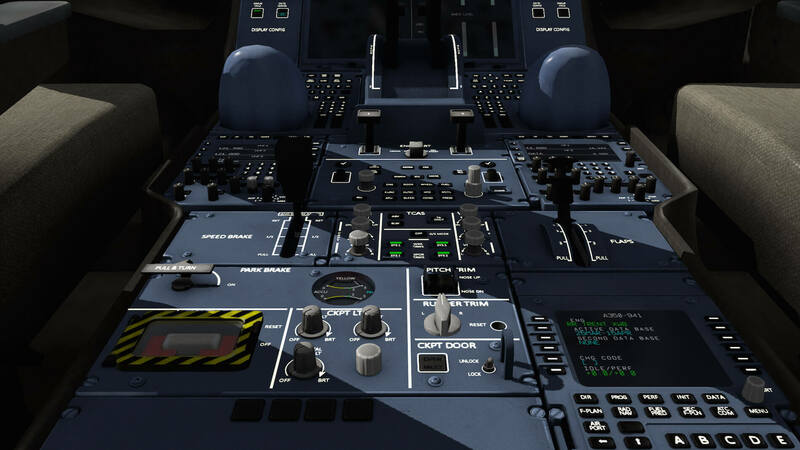 Many aircraft systems are simulated as well as the ECAM system. Is it a worthy X-Plane 10 add-on? Yes, without doubt a worthy a Airbus add-on, especially for those who love Airbus aircraft, like me! For those who are stuck to Boeing aircraft, I would say … give it a try and see for yourself how magnificently an Airbus aircraft flies. I think I covered most of the Flight Factor aero A350, but as you know, it’s always possible I’ve forgotten something. In case you’ve a different experience or want to share issues or thoughts with me, feel free to contact me. You can reach me via email address Angelique.van.Campen@gmail.com or Angelique@X-Plained.com. 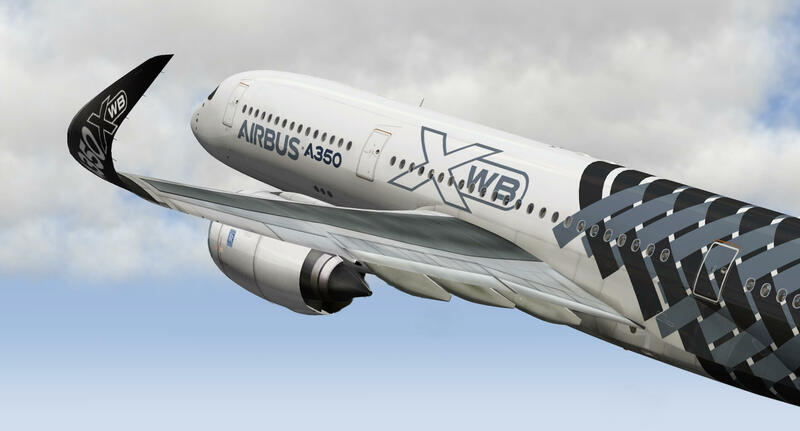 More information about the Flight Factor Airbus A350 can be found at the dedicated X-Plane.Org web page. The A350 does not support SID / STAR. Which means in the description. Basic SID / STAR implementation using X-Plane FMS files. Hey, great work on the reviews! I would suggest using SimBrief especially because it offers SIDS and STARS. Of course this is not applicable on the A350, but it works great for other aircraft. It also gives you your block fuel amount so you don’t have to do your own calculations such as contingency fuel and so on. I highly recommend this website. Keep those posts coming! Safe skies! Dude, stop with that 25 FPS nonsense. Human eye can easily see the difference between 30, 60 and 144 FPS. 25 FPS is when you consider something to be smooth, but human eye can see a lot more FPS! Just look at 144 Hz and 60 Hz monitor. First of all, in my opiinon it doesn’t cost so much more effort to refer to the reviewers name or is it me? That said, that you have this opinion is OK, but who tells me that you statement is the right one. So I think it was better to write “in my opinion” “ or I see it different”, right? Besides that, I’m wondering what this has to do with the actual review contents! Would be nice to add a sort of recorded video with a cabin full of passengers, would be very imersive! have you tried this plane with XHSI as well ? does it show the route on the ND in XHSI ? Thank you for your reply and thanks for bringing up eras however, I checked their site and one of the problems is that it’s a flight planner ONLY for the Windows platform. That said, all other X-pLane simmers using Mac or Linux can’t use it and that’s because I tried to offer a list of flight planners of which all work online. In that case it doesn’t matter which OS platform you’re on. No, I haven’t used or tested XHSI. Perhaps I should but time is also limited.